The one of a kind Dorje Shugden Oracle statue in Wisdom Hall Audience Room, Kechara Forest Retreat, Malaysia. Click on image to enlarge. Dorje Shugden is a very special Dharma protector, with a close relationship to people of this day and age, due to our karmic propensity. One of the special ways in which we can communicate with Dorje Shugden, in order to receive blessings, advice and healing is through an oracle. 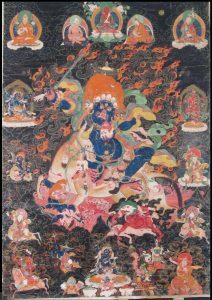 The tradition of oracles is not something unique to just the practice of Dorje Shugden, or other Buddhist Dharma protectors for that matter. All cultures and races have relied on oracles at some point, and oracles have played pivotal roles throughout history all over the world. Oracles have played an important part in my life, as they are the means of connection with my Dharma protector Dorje Shugden. It was with this in mind, and with the memory of seeing oracles statues in the past, that I had an oracle statue created depicting the oracle of Dorje Shugden in full trance. 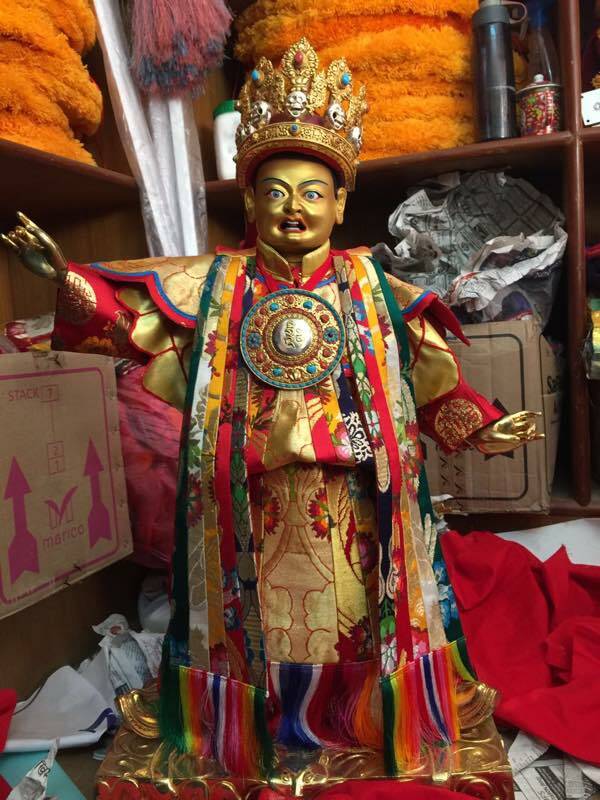 This Dorje Shugden oracle statue is the first of its kind in the world. It is currently enshrined in the Wisdom Hall Audience Room, at Kechara Forest Retreat in Malaysia. 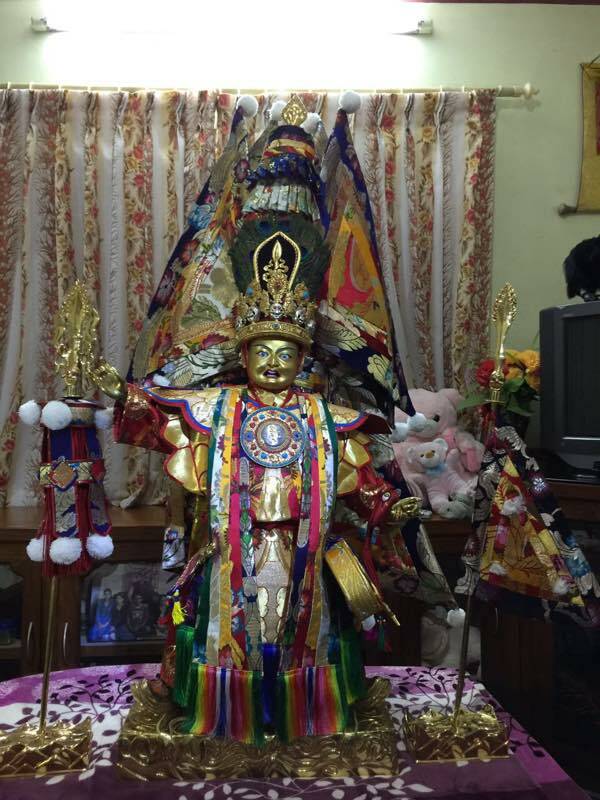 As an oracle statue which has been consecrated, it can be prayed to in order to create the causes to be able to communicate with Dorje Shugden in the future. Oracles facilitate communication between ordinary practitioners and the divine. Therefore having such an oracle statue, which is the embodiment of Dorje Shugden, denotes our closeness with the Dharma protector. I hope you enjoy reading more about this wonderful and holy statue. Whenever you come to Kechara Forest Retreat in Malaysia, make sure you have a khata and have audience with this very special oracle statue. It is highly blessed and plants the seed for you to have close connections to Dorje Shugden always. While most would find the tradition of oracles strange or unbelievable, a look into history provides us with evidence that oracles were indeed major figures in people’s lives. In the West we have the examples of the Greek oracles, the most prominent of whom were the Pythia, the priests and priestesses of Dodona, and the Sibyls. These oracles played major roles in society, influencing politics, agriculture, religion and even warfare. It was through these oracles that people believed the ancient pre-Hellenistic and Hellenistic gods and goddess interacted with ordinary humans. A depiction of the Pythia or High Priestess at the Temple of Apollo, who also served as the Oracle of Delphi. By John Collier, 1891. In essence they were considered portals through which the gods spoke directly to their adherents, following a variety of different methods. The Pythia, also known as the Delphic oracle, was the High Priestess at the Temple of Apollo in Delphi. 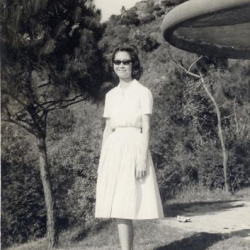 She was known to be filled with the spirit of Apollo when she made oracular pronouncements. The priests and priestesses of Dodona were similarly influenced by the god Zeus and the goddess Dione. In this state they would interpret the sounds of bronze objects hanging from trees in the sacred oak grove in order to give prophecy. The Sibyls were women who gave prophesies and advice while in frenzied states. They are said to have been under the influence or possessed by chthonic deities, who were gods, goddesses or spirits who lived underground or in the underworld. Examples of highly revered and influential oracles are found in many other ancient civilizations, including countries in Asia Minor, the Ancient Near East and Africa. Similarly, oracles have played pivotal roles in the lives of those in eastern countries such as China and India as well. In China and among the Chinese diaspora, oracles are more commonly referred to as mediums, who take trance of various kinds of deities to predict the future, give advice or even perform healing. Taking trance of deities such as the Nine Emperor Gods, or even local deities, these mediums intercede in the lives of devotees and supplicants, aiding them however they can, such as creating talismans also known as ‘fu’, which are used for purposes of spiritual protection, improving wealth, enhancing relationships, dispelling sorcery or black magic, and for any number of other reasons. These oracles/mediums continue to be relied even until today, highlighting its centrality to Chinese folk belief. In India, oracles or mediums take trance of various gods, goddesses and beings, from the highest classification to the lowest. They are relied upon in times of need, to provide advice, blessings, curing of the sick, etc. Even amongst the Indian diaspora in places such as the United Kingdom, United States of America, Australia, and New Zealand, people consult these oracles for means of betterment, as well as relying on modern institutions, merging both contemporary and traditional lifestyles. As we have seen, the tradition of consulting oracles for both worldly and spiritual reasons has been widely practiced since ancient times. However, in today’s world, the practice is in danger of dying out completely in many cultures around the world. 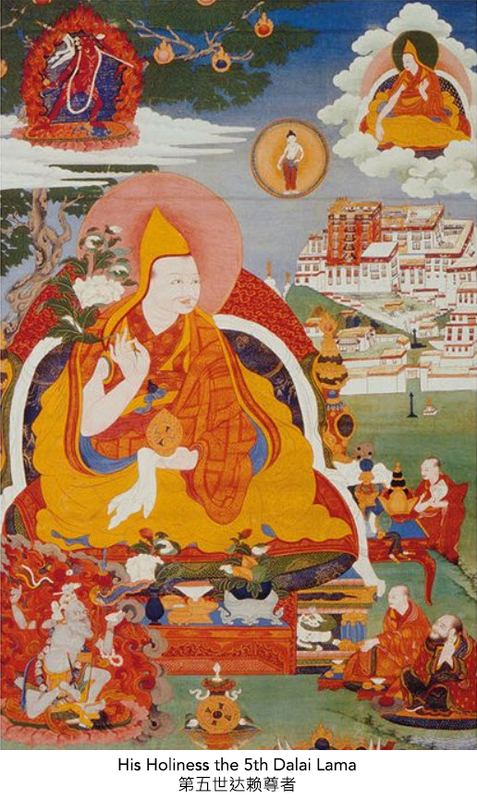 Amongst the major world religions, Tibetan Buddhism is somewhat unique in that the tradition of consulting oracles continues to play a major role in the lives of its practitioners. Oracles in Tibetan are called ‘kuten’, which literally means ‘physical basis’. An oracle is a man or woman who acts as the physical basis for a particular non-physical being to enter them. This means that the mind and energies of a particular being can temporarily inhabit the body of an oracle for a period of time. This being can be a spirit, naga (a particular class of snake spirit), and so forth; or even a higher level being such as a god, or protector deity. Once the being leaves the body, the person regains their ordinary consciousness. Consulting oracles is an integral part of Tibetan Buddhism. Here we see His Holiness the 14th Dalai Lama consulting the Nechung Oracle, who takes trance of Dorje Dragden – a form of Pehar. In the Tibetan Buddhist tradition, oracles can be ordained or lay practitioners who are blessed and trained to take trance, by a qualified lama. As such the psychic energy channels of an oracle would have been consecrated and cleared by meditational practice in order for a protector deity to enter easily. Potential oracles are chosen by the particular Dharma protector, who could take trance in them; via dreams and other signs; as appointed by a lama; or as requested by the potential oracle candidate themselves. Whatever the method of choosing the oracle, the candidate would nevertheless still require to be trained by a qualified lama. Oracles can take trance at any time or in any place, however as part of the tradition of oracles, official trances usually occur at an appointed time and place. Oracles provide a direct connection to the divine. Therefore when we rely on the tradition of oracles we are able to receive blessings and advice for our various needs. Without oracles, practitioners without the higher attainment of being able to communicate with the deities directly, would be bereft of such benefit. Within the Tibetan Buddhist tradition, oracles take trance of the various Dharma protectors, either subdued beings sworn to aid practitioners, or the enlightened beings who have emanated in the form of Dharma protectors. These beings are charged with the sacred task of removing obstacles and providing divine protection along a practitioner’s spiritual journey towards enlightenment. 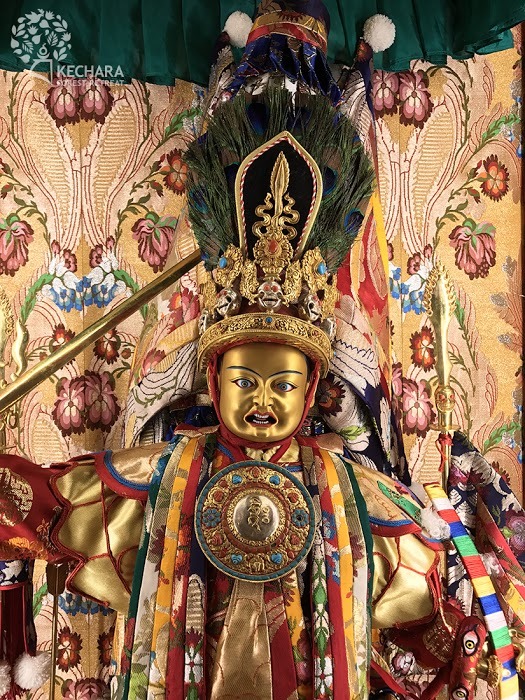 Oracles themselves are highly blessed because it is through their body that they are able to facilitate direct contact between the Dharma protector and practitioners. 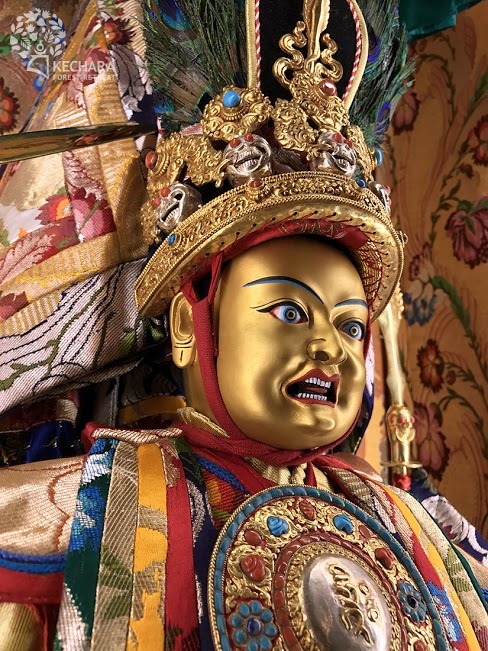 While in trance of an oracle, Dharma protectors such as Dorje Shugden give advice on both spiritual and worldly matters in times of uncertainty, bestow blessings and even perform miraculous acts of healing, ridding those who are ill of their various afflictions. On a higher level, they also bestow spiritual teachings that lead sentient beings out of the suffering of cyclic existence and aid them on the journey towards liberation. Oracles are an integral part of Tibetan Buddhism and Tibetan culture in general. Over the course of centuries as the entire country was shaped through the practice of Buddhism, cultural institutions such as language (the Tibetan script was created in order to translate Sanskrit Buddhist texts), and politics, became intrinsically linked to religious practices. The tradition of oracles is likewise linked to a variety of institutions including both religious and political spheres. 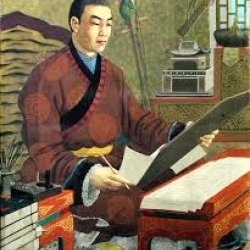 Dorje Dragden, commonly refered to as Nechung/Pehar (the speech emanation of Pehar Gyalpo), who takes trance in the Nechung Oracle. 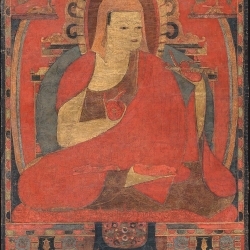 Shing Cha Chen (the qualities emanation of Pehar Gyalpo), who takes trance in the Gadong Oracle. Tenma and her 11 sisters, who take trance in the Tenma Oracle. Setrap, the wrathful emanation of the Buddha Amitabha. Click on image to enlarge. These deities, and many others, act out of compassion in cases where they are enlightened, or out of adherence to oaths in cases where they are worldly oath-bound deities, in order to aid practitioners. And in doing so, fulfill their spiritual role to aid practitioners in whatever way they can. From the viewpoint of Buddhist philosophy, their entire existence in that particular form, is to aid practitioners. The prayers and mantras used to invoke them are for this very same reason. For those who do not believe the enlightened beings can take trance in oracles, they limit the potential of enlightened beings, and in doing so negate the very reason that these beings would manifest as Dharma protectors – to aid practitioners on the Buddhist path in any way possible. 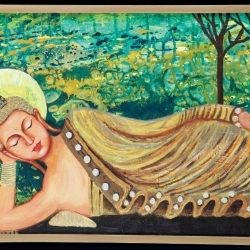 Within the practices of Buddhist tantra it is believed that the body has a complex network of 72,000 psychic energy channels throughout the entire body. These psychic channels converge and intertwine at various points in the body, and are known as ‘chakras’. Five of these are of particular importance, and are located at the crown of the head; between the eyebrows; the throat; the heart; the navel; and at the tip of one’s secret organ. Chakras are points in the body where the psychic energy channels loop or knot around each other. Opening these chakras allows deities to enter an oracle’s body. Click on image to enlarge. They are often portrayed as lotuses in art or in visualization techniques, and are depicted as having multiple petals. Common depictions of the important chakras have 32 or 64 petals. These petals actually represent the number of energy channels that converge at that particular chakra. This is because they are tightly intertwined or knotted and thus resemble a lotus blossom. 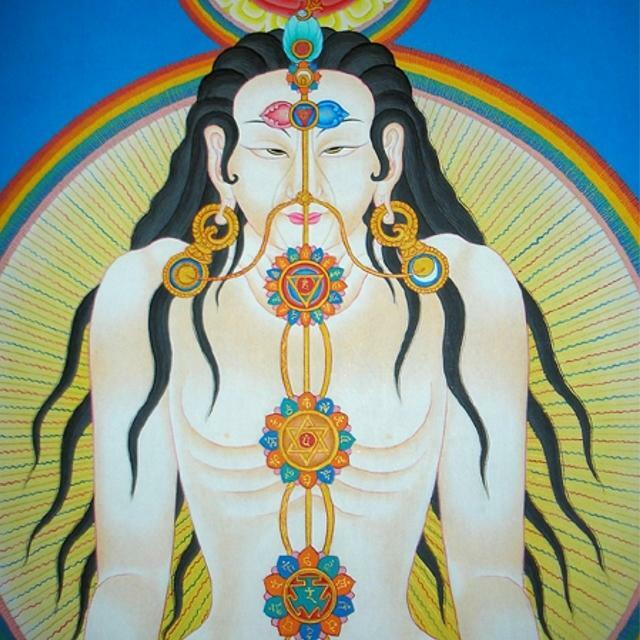 During trance, these chakras are opened either by meditation or by force, in which the particular being or Dharma protector takes possession of the body. However, there are people that have chakras that are naturally easier to open, therefore they are easier to train as oracles. Psychic energies called ‘lung’ in Tibetan, ‘qi’ in Chinese, or ‘prana’ in Sanskrit travel along the vast network of psychic channels that is laid out throughout the body. The psychic energies regulate bodily function and it is believed that the subtle mind rides on top of these energies as well. In Buddhist tantra, the recitation of mantras combined with visualization regulates these vital energies in order to purify karma and develop spiritual attainments. For a potential oracle, the training as recommended by the lama is very important to prepare the psychic channels for trance. For a potential oracle, the training begins by receiving refuge from the lama. By receiving refuge the candidate is protected from negative beings that may enter and cause harm. 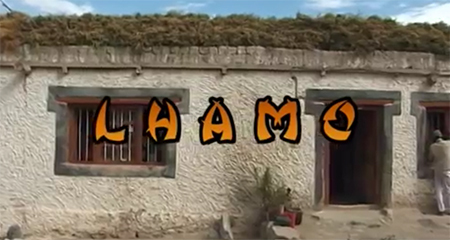 The lama then performs a ritual called ‘tsa ko’ to open the chakras and psychic energy channels of the oracle. This allows the higher beings to enter the oracle, while blocking negative beings from entering. 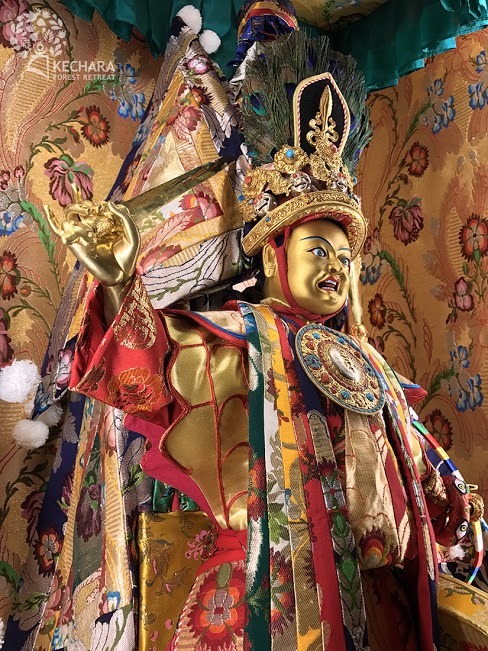 Following this, the lama bestows the empowerment of Lama Tsongkhapa, and the candidate engages in a Lama Tsongkhpa retreat combined with the practice of Lama Chopa, also known as Guru Puja. This is where one engages in the meditation of Lama Tsongkhapa with the recitation of the migtsema mantra and the recitation of the Lama Chopa liturgies. This is done with all the required offerings and tormas (ritual cakes offered to the deities) needed for the usual four sessions of retreat a day. The duration of the retreat is the time needed to complete 100,000 migtsema recitations, and would normally take around a month and a half to two months to complete. Engaging in various tantric retreats, including the retreat of Lama Tsongkhapa, is a pre-requisite for the oracle to have steady and clear trances of the protector deities. After that, the candidate receives either the Yamantaka or Hayagriva initiation and then engage in a retreat on the deity for four sessions a day until one has completed 1 million of the main mantra and 100,000 for each of the other mantras. In the case of Yamantaka, there is one main mantra and three other mantras. This retreat takes approximately a month and half to two months if it is done well. Yamantaka retreat is known to extend one’s life, remove all interferences such as malevolent spirits and so forth and the psychic channels are charged with Yamantaka’s blessings and cleared in preparation for a clear trance. After retreat, one would go to the lama to see if it is necessary to enter into another retreat again. After completing a Yamantaka or Hayagriva retreat, one would need to receive the life-entrustment of Dorje Shugden and engage in retreat of Dorje Shugden. 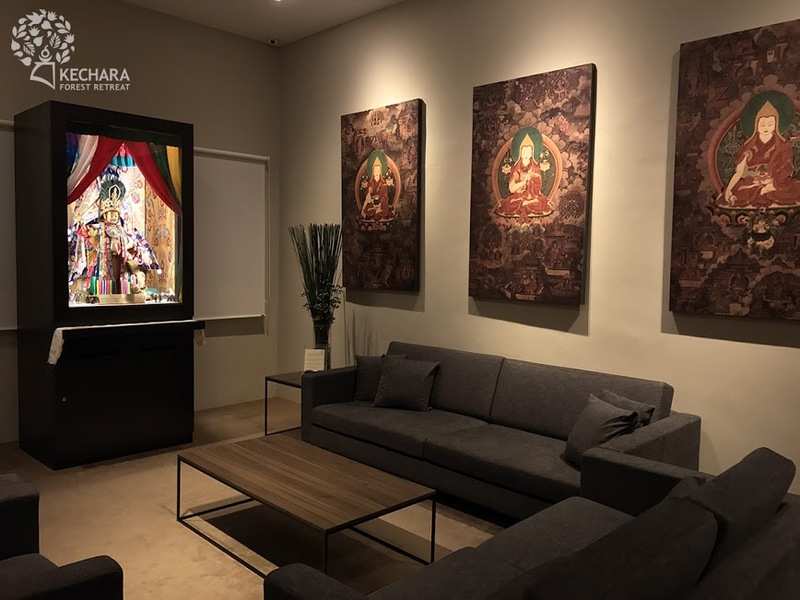 Dorje Shugden retreat requires four important components – Lama Tsongkhapa Guru Yoga, Lama Chopa, Yamantaka sadhana and then the Dorje Shugden liturgies. Therefore, the oracle-in-training would engage in these four liturgies during retreat, complete with the offerings and tormas for four sessions a day. During retreat, one would complete 1-10 million Dorje Shugden mantras and this would be for a duration of 3 to 4 months. During retreat, the lama summons the oracle-in-training so that he can perform a ‘chabtrul ritual’ to purify the chakras and psychic channels. He would also invoke Dorje Shugden to come forth to enter the oracle in training and sometimes Dorje Shugden himself would enter for a short while and leave. However, during the training process, it is usually the entourage deities who enter to further purify and unblock the psychic channels. In the beginning, the oracle-in-training does not take trance unless in the presence of the lama to ensure that it is the correct deity that is entering the oracle. The lama would then continue to bless, advise and guide the oracle in training and at times, the lama would continue to prescribe further retreats of Yamantaka, Hayagriva or even Vajrapani to further prepare the oracle in training so that he or she becomes a fully qualified oracle. Those who take trance of the protector deities, in this case the enlightened protector Dorje Shugden, are very blessed. This is because they are able to facilitate direct contact with the protector to take trance, give advice, blessings and heal people of their various afflictions. On a higher level they can even give teachings that lead sentient beings out of their suffering and aid them on their spiritual journey towards enlightenment. Some people may find an oracle useful, some not, but the rich tradition of oracles is genuine and has been around for hundreds of years. Since the time Dorje Shugden manifested as a Dharma protector, he has been taking trance throughout the various generations of oracles for 350 years. The most highest and attained lamas trained, blessed and certified certain individuals to take trance of Dorje Shugden, Setrap, Kache Marpo, Namkar Barzen, Shiptak Gyene, Tsangpa, Jowo Chinkarwa, etc. These oracles have given highly accurate predictions that transcend space and time, obviously showing there is a superior being speaking through them with unlimited clairvoyance. Whether our particular tradition relies on oracles or not, it does not matter but there should not be one hard and fast rule for everyone. If your tradition does not believe or rely on oracles, that is your choice. But there are traditions and people who have received immense benefit from consulting oracles and they have every right to do so. So do not disparage this sacred tradition or try to disregard this tradition. Some decisions can be made based on logic and clear thinking, and some cannot. For those questions that are important and are beyond logic and ordinary thinking, we can consult a qualified oracle in trance of a protector. Oracles are not outdated nor is their use outdated as this is a personal choice. Buddha Shakyamuni’s teachings are timeless and can never be outdated. Likewise, some may say religion is outdated and tell you to simply use your own mind, but the teachings of Buddha are timeless and forever applicable. As long as an enlightened being such as Dorje Shugden takes trance of oracles, advice and help will always be needed and therefore timeless. Suffering and its solution is never going to be outdated. Protectors taking trance in oracles is just a manifestation of an enlightened protector’s compassion reaching out to us. Some say enlightened protectors cannot speak or enter a human oracle. That is not true and by saying so they limit the powers and abilities of a fully enlightened mind. Enlightened beings have many ways to benefit others. Do not limit them with our own limitations. Do not limit what they can do with our limited ways of thinking. Great masters like His Holiness Kyabje Pabongka Rinpoche, His Holiness Trijang Rinpoche, and His Holiness Kyabje Zong Rinpoche blessed certain individuals and personally trained them to become oracles. If we have peerless faith and devotion in these lineage masters then we must have trust in all their works and activities including the creation, certification and usage of these oracles. After all, how can some activities of Trijang Rinpoche be faultless and some have fault? Many of the modern day oracles were picked or approved, blessed and certified by His Holiness the great Trijang Rinpoche Jetsun Losang Yeshe. If we believe in our lineage masters such as Trijang Rinpoche, Zong Rinpoche and Pabongka Rinpoche, then we must trust their decision in sustaining, creating and use of the oracle tradition. These great beings often consulted the Dorje Shugden oracles throughout their lives. These great masters sustained this tradition. Since the days of Tibet, there have been famous and very beneficial oracles of Dorje Shugden all the way until the present day, and this tradition will continue. We are lucky these ancient and sacred traditions have been preserved and handed down by our lineage lamas so we can benefit from their existence. His Eminence Tsem Rinpoche first laid eyes on an oracle statue in Nechung Monastery over 25 years ago and at that time made an aspiration to have a similar oracle statue of Dorje Shugden made so that people can pray and create the powerful affinity to have audience with Dorje Shugden, be blessed by his divine presence, and have the great opportunity to listen to his divine speech. Hence, the statue of the Dorje Shugden oracle creates the powerful cause for an oracle to arise in order to be of benefit to many beings. 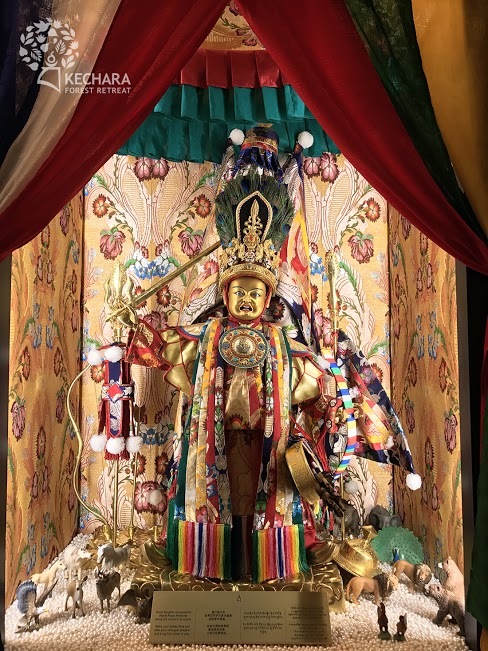 When we pray to an oracle statue and make offerings, we create a closer connection to Dorje Shugden because he enters oracles to speak to us, bestow his blessings and provide us advice. This in turn creates the causes so that in the future we will always be able to communicate and speak to Dorje Shugden, as the oracle statue denotes closeness. Normally, as ordinary beings, we are not able to see or communicate with Dorje Shugden directly, but through an oracle we have this opportunity. 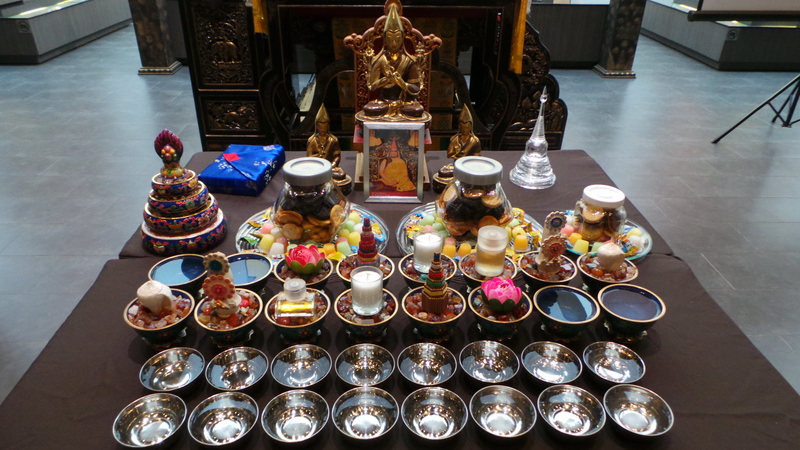 Therefore making prayers and offerings to the statues denotes a closer connection to Dorje Shugden. The oracle statue housed in Wisdom Hall’s Audience Room, is of an oracle in full trance of Dorje Shugden. The statue was consecrated on April 11, 2017 by His Eminence Tsem Rinpoche, who invited Dorje Shugden to reside in the statue. Therefore, whether we pray to Dorje Shugden in his normal form, or to this particular oracle statue, there is no difference as we are praying to the same enlightened being. 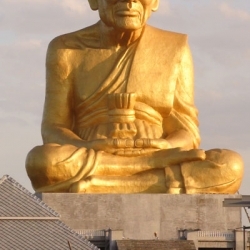 The statue measures 46 inches in height, including the tall Dharma protector headgear. The width of the base is 17 inches and the depth of the base is 7 inches. The actual statue making process began in April 2016, and was fully completed by the end of November 2016. The detailed statue is made from brass and plated with gold. 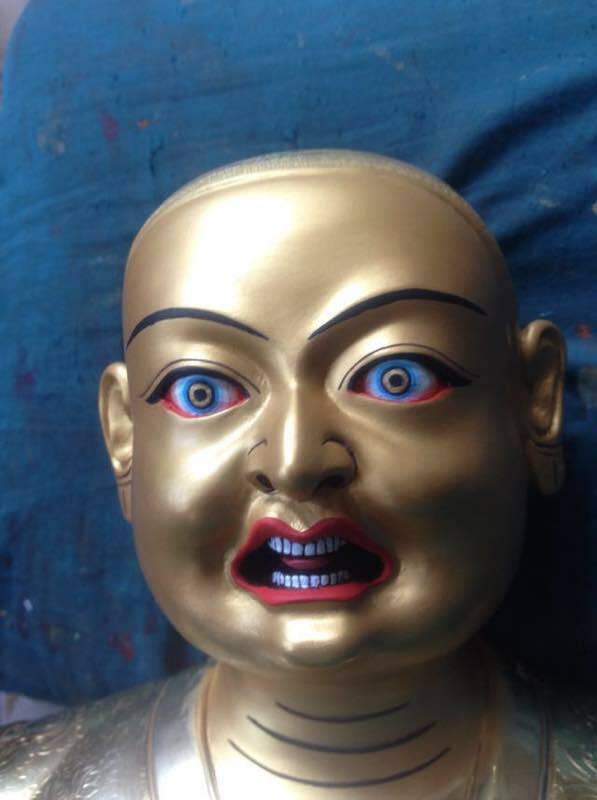 The face is painted with gold following the traditional Tibetan practice of applying gold as an offering to the enlightened beings. 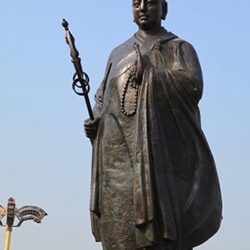 The statue has also been filled with the traditional set of mantras and holy items. The process of making the statue was difficult and complicated, as no one had ever made a Dorje Shugden oracle statue before. Many parts of the statue, such as the base, details of the robes, the hat, the boots, and so on were also discussed at length with the statue maker and many revisions were made to ensure the statue was correct. Creating the various implements in correct proportion to the statue was also a challenge. 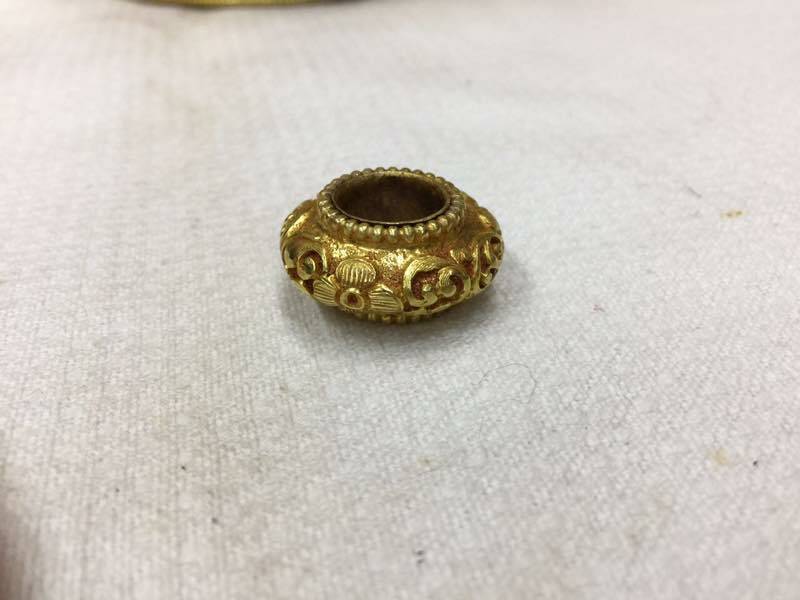 Therefore miniature adornments for the headgear and clothes had to be sourced from other suppliers who are seasoned in making implements for oracles. The brocade robes for the oracle statue took two weeks to make. 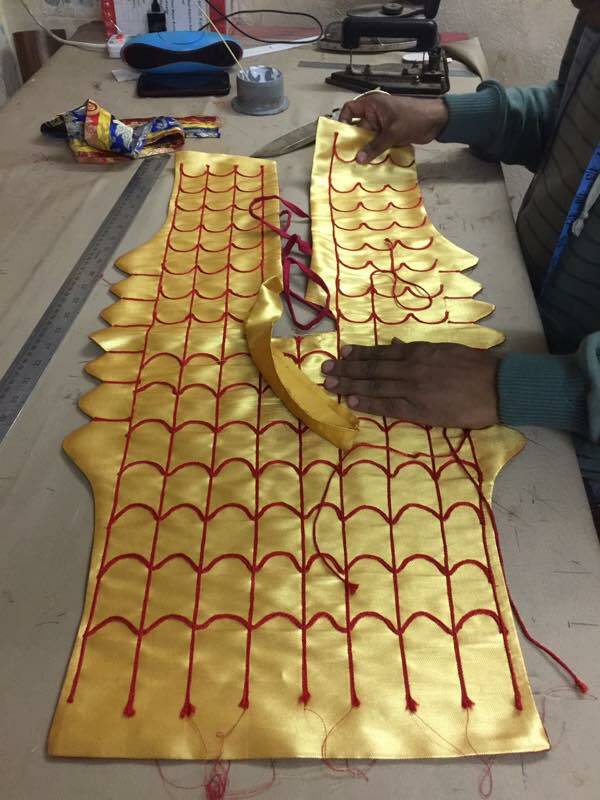 As the tailor was experienced in brocade fabric work, the clothes turned out perfectly. It was also the first time the tailor had made oracle clothes in such a small size. A special altar box was also designed for this one-of-a-kind oracle statue. The altar was made from solid nyatoh hardwood. It is lined with traditional Tibetan brocade, with real gold thread and a special ‘lhari’ or parasol. At the bottom of the altar is a cabinet for people to place their wishes written on paper. The altar box took two weeks to complete. A close up of the face of the statue. 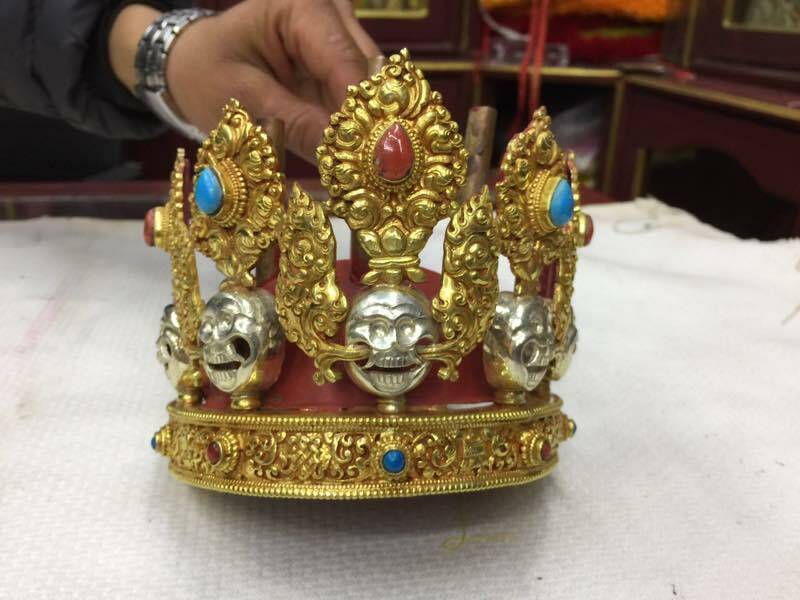 It has been painted in traditional style, with real gold applied as an offering to Dorje Shugden. The intricate detail of the headgear and miniature size of the adornments were difficult to make. 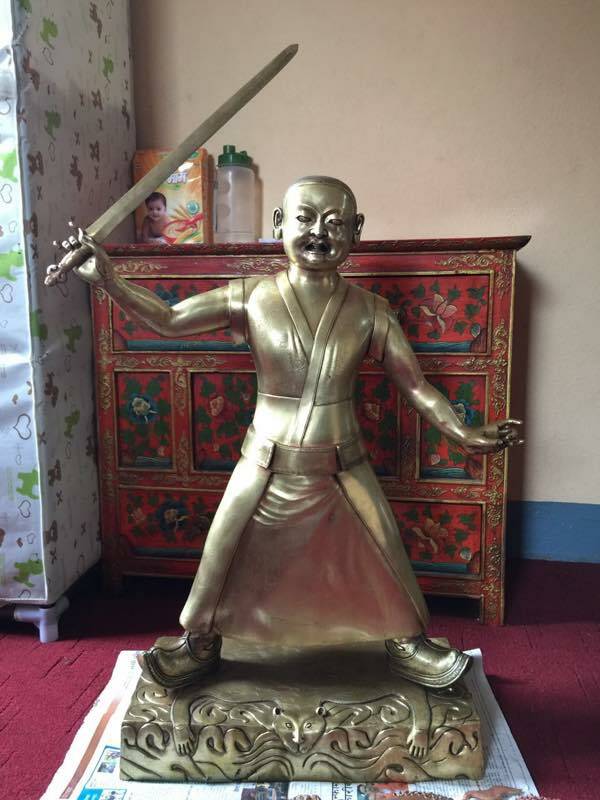 While Dorje Shugden carries a wavy wisdom sword, when his oracle is in trance, he wields a normal straight sword. The sword is similar in significance to the one held by Manjushri, the Buddha of wisdom, and indicates that Dorje Shugden is none other than Manjushri himself. 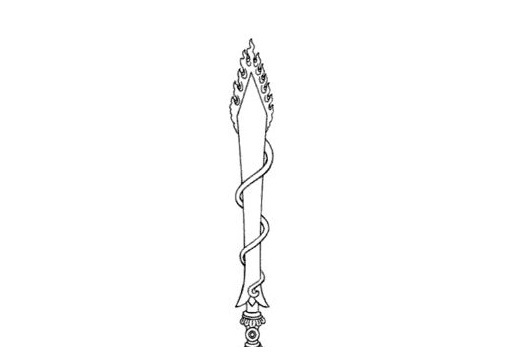 The wisdom sword cuts through ignorance and delusions that arise from our negative karma, so that the obstacles and obscurations on our spiritual path towards enlightenment are removed. Therefore, it shows just how efficacious Dorje Shugden’s practice is for the purposes of purification, removing obstacles and ultimately to gain merits and attainments. 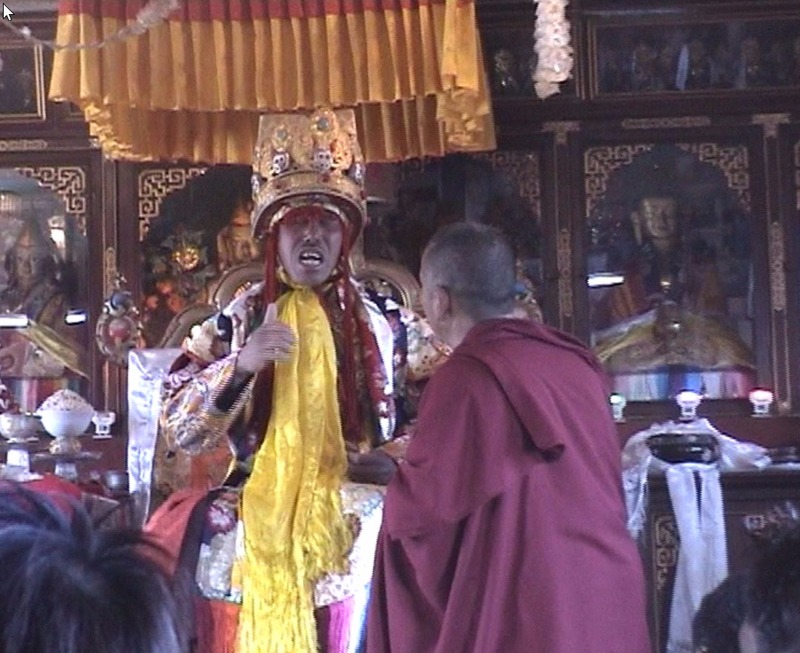 When an oracle of Dorje Shugden enters trance, he will pick up the sword and engage in what is known as a Vajra Dance. 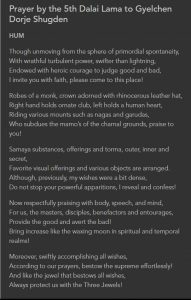 This is a warrior’s dance to clear the obstacles for those present and for the Buddhadharma in general as well as dispelling negative energies and negative entities in the location of the trance. This clearing of the negativities also implants many positive blessings into the land. During this dance, he wields the sword and cuts through obstacles to the preservation and growth of the Dharma, as well as cutting away the obstacles of those in attendance. 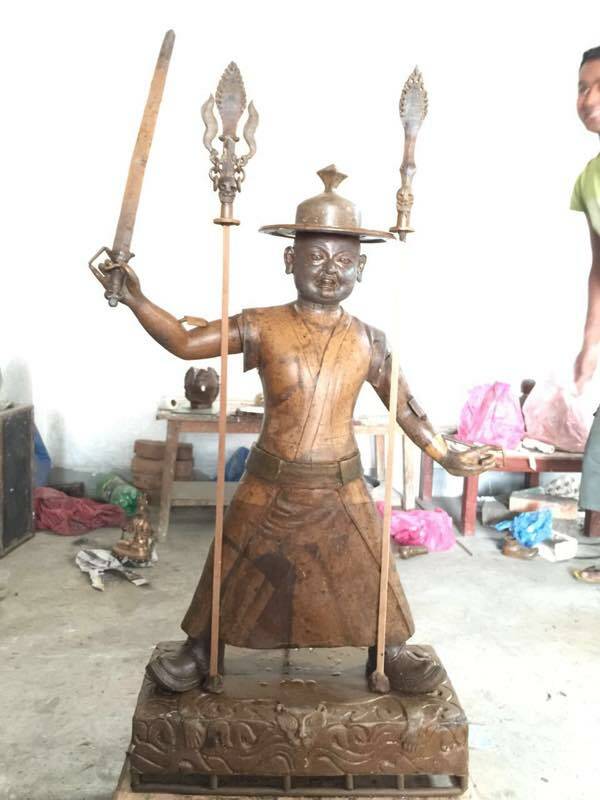 By holding the sword, the oracle statue represents this particular compassionate activity of Dorje Shugden. Placed on one side of the oracle statue is the golden domed hat worn by Dorje Shugden. 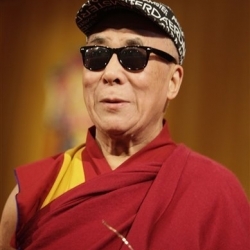 In most trances of Dorje Shugden, the oracle wears this hat. 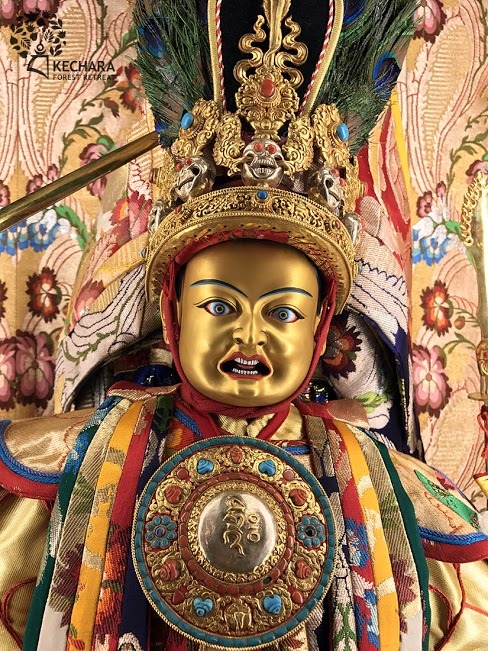 It is symbolic of the protection Dorje Shugden grants to practitioners and upholders of the highest view of Madhyamika, Nagarjuna’s special view of Emptiness as embodied perfectly in Lama Tsongkhapa’s teachings and lineage. 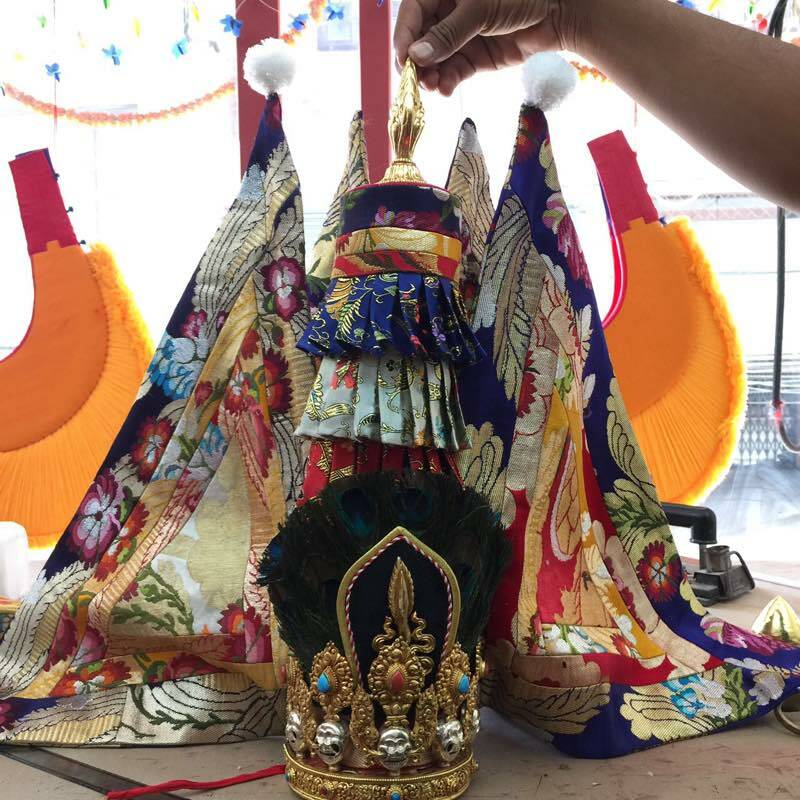 The domed hat is traditionally a type of hat worn by a travelling high lama, thus symbolising Dorje Shugden’s mobility and swiftness in coming to the aid of sincere practitioners, and is a quality embodied in the statue to aid practitioners. The head-dress that is worn by the oracle statue mirrors the one that is worn by oracles when they take trance of wrathful protectors. Dorje Shugden is unique in that sense, as he can wear his usual domed travelling hat or the larger head-dress when in trance. This head-dress is festooned with feathers and other symbolic ornaments commonly associated with a wrathful protector. 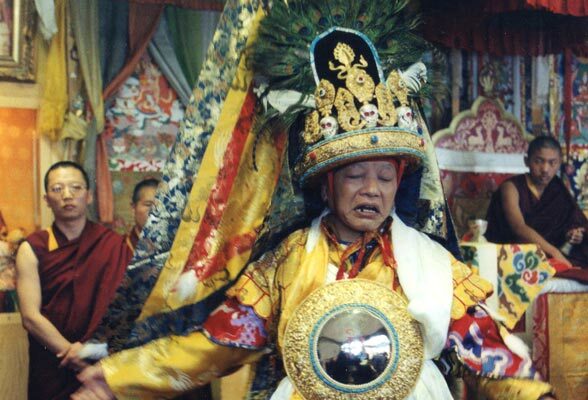 An oracle of Dorje Shugden will wear the large head-dress only when taking wrathful trance of Dorje Shugden, or if the oracle takes trance of other protectors such as Setrap, who is very fierce. The head-dress is extremely heavy, and in the past would have taken two or more able-bodied monks to carry. Therefore only an oracle in trance of a protector would be strong enough to wear it, as the weight could not be handled by the human body under normal conditions. The bow represents wisdom, and the arrows represent the various compassionate and skillful methods used by enlightened beings to help spiritual practitioners achieve their goals. In essence they represent the six perfections: the bow represents wisdom, which launches the arrows of generosity, morality, patience, joyous effort, perseverance and concentration. They also represent the union of wisdom and compassion, which is necessary to gain higher spiritual attainments. 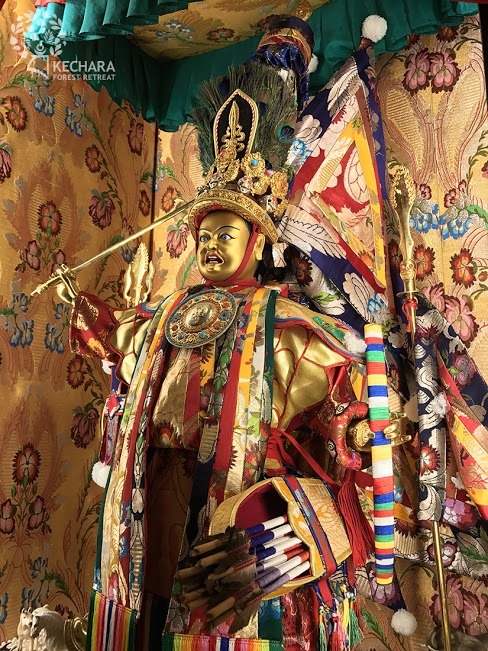 As implements held by the oracle statue, they represent on the one hand that Dorje Shugden’s actions to aid practitioners stem from enlightened wisdom and compassion, and on the other that he can help practitioners gain these same qualities. 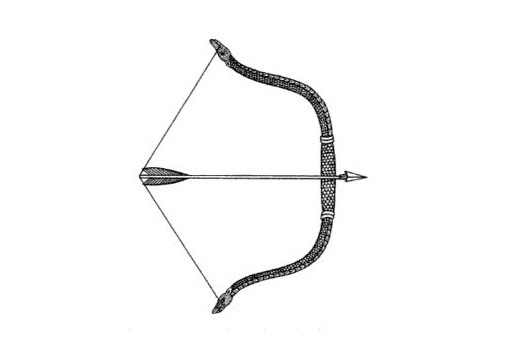 It is also said that the bow is used to shoot arrows at the heart of the enemy. The enemy here refers to our delusions and the negative karma they create that makes us suffer. Therefore they are symbolic of gaining spiritual realisations leading to enlightenment. 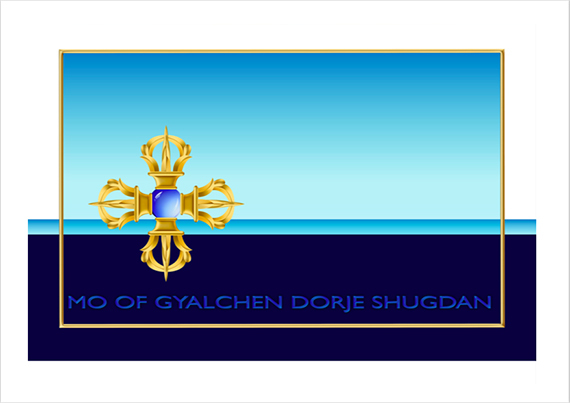 The smooth shaft and shape of the arrows represent the central channel of our psychic bodies; the three steering feathers represent the purity of achieving the enlightened body, speech and mind of an enlightened being; and the five coloured threads wrapped around the arrows represent the Five Dhyani Buddhas (Vairocana, Amogasiddhi, Amitabha, Ratnasambhava, and Akshobhya). Tied to the back of the oracle statue are five warrior flags. In ancient times, warriors used to wear flags in battle to make themselves look bigger and more frightening. These flags also served to identify which kingdom or faction the warrior was fighting for. 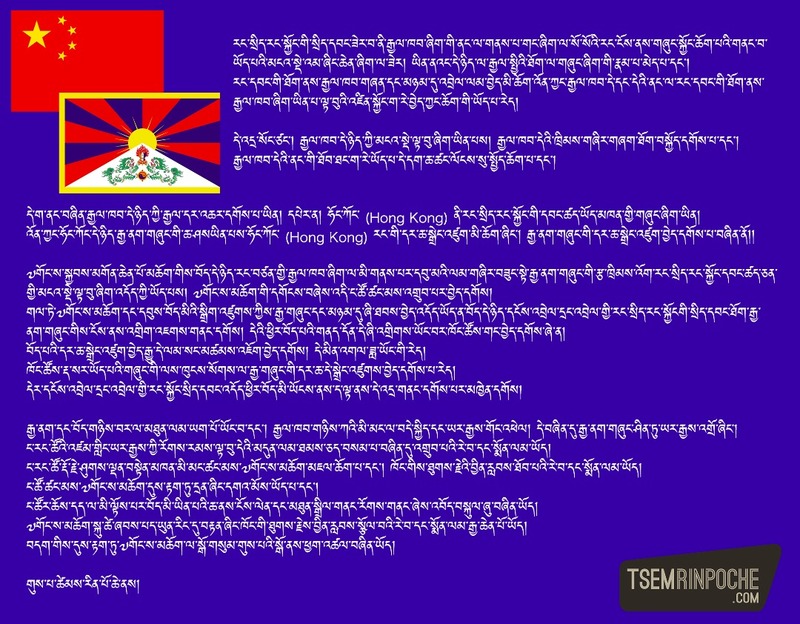 The flags are accoutrements of the oracles when they take trance of wrathful forms of the Dharma protectors. 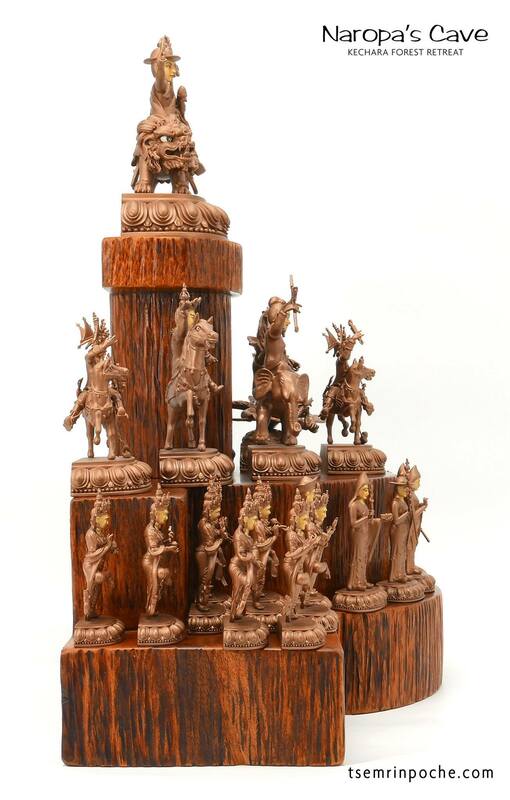 On this Dorje Shugden oracle statue, the flags represent the Five Dhyani Buddhas which represent Dorje Shugden’s enlightened nature and thereby, his mighty ability to battle our negative karma and delusions. When our negative karma and delusions are lessened, the suffering we go through is alleviated. They can also be representative of the oracle being able to take trance of other wrathful protectors such as Setrap and Kache Marpo. 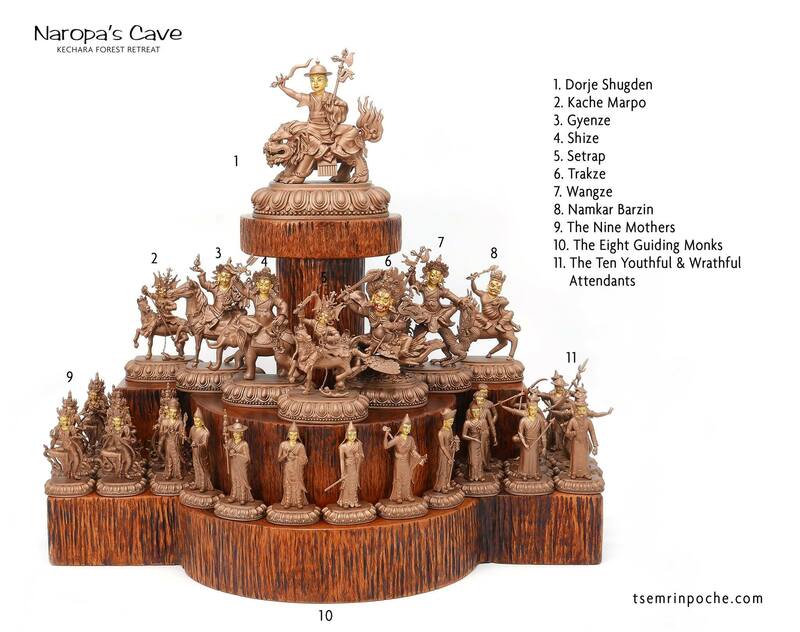 The spear standing to the side of the oracle statue represents Kache Marpo, Dorje Shugden’s main minister. He is a powerful Dharma protector is his own right, however he chooses to assist Dorje Shugden in his enlightened work. The spear is also the principle implement that he wields in order to pierce and destroy obstacles faced by the practitioners he is assisting. 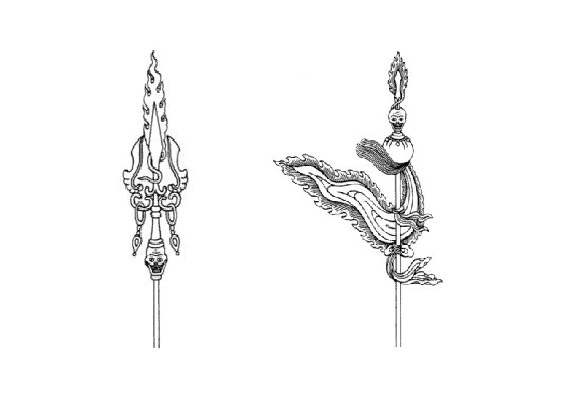 The trident represents the Dharma protector Setrap. Some oracles who take trance of Dorje Shugden can also take trance of Setrap. When Setrap enters the oracle, he will grab the trident as a sign that he is present. Setrap has a very close relationship with Dorje Shugden. 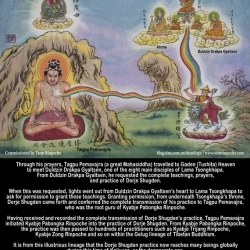 The previous incarnation of Dorje Shugden, whose name was Tulku Drakpa Gyeltsen, practiced Setrap strongly. In fact Setrap was one of his main protector deities, and as such he had developed a strong connection with him. 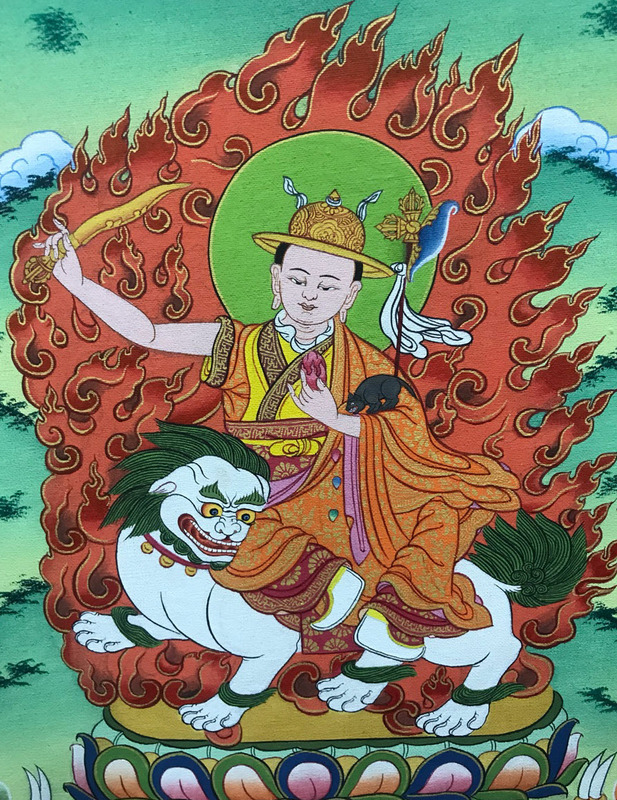 When Dorje Shugden first arose as a protector, Setrap was present as a senior Dharma protector to introduce him into the pantheon of Dharma protectors. Their relationship is so close that Setrap also resides in Dorje Shugden’s ‘mandala’ or abode. In this mandala, the Buddha Amitabha resides at the upper-most level, Setrap and his entourage reside on the level beneath, and Dorje Shugden and his entourage reside on the level below that. 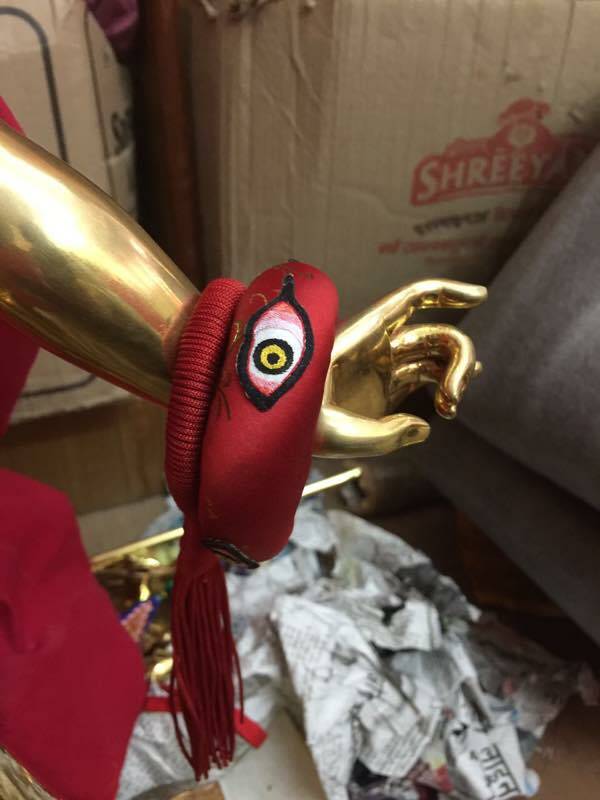 The pudri is a thick bracelet worn by the oracle when Dorje Shugden takes trance. This implement is made from a red coloured brocade, with three large eyes embroidered on it. It is a symbol of Dorje Shugden’s ability to see into the three times to grant accurate and enlightened advice, as well as a very powerful symbol of the protection he can grant from spirit harm, health problems, and all manner of obstacles we can face in life. Various animals can be seen surrounding the oracle statue of Dorje Shugden. These animals are offered for a number of reasons. 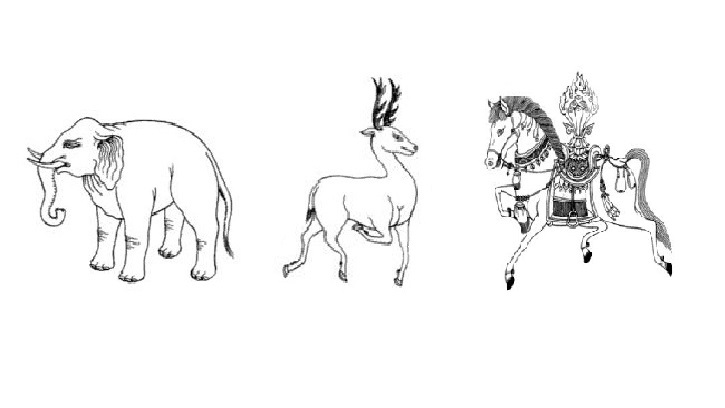 The first is that they represent various animal mounts often associated with deities. 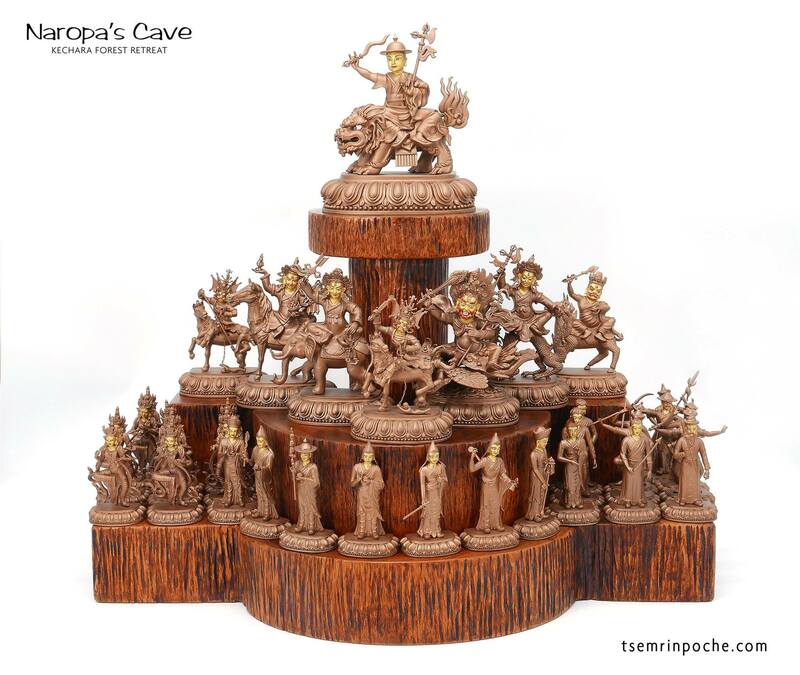 These are made as an offering to entreat Dorje Shugden to come to our aid more quickly, as some of the animals are known for the ability to travel fast, such as horses. The second is that some animals also have their own auspicious meaning when offered. For example the white elephant represents the Buddha. It represents a pure, pristine and controlled mind. Black elephants on the other hand represent the uncontrolled and unruly mind of an unenlightened being. The deer represent the natural beauty, harmony and fearlessness found in the pure realms of the enlightened beings. In pairs, they signify happiness, prosperity, longevity and good health. In ancient India, the lion was a symbol of sovereignty and protection, and as such represents the enlightened beings. Horses are offered to symbolise traveling quickly, as in the ancient world they were the fastest mode of transport to cover great distances. Peacocks have the natural ability to ingest poisonous plants and herbs without being effected, and the imagery of a peacock is used throughout Buddhist practice as a metaphor for taking obstacles and transforming them into something good. Bears symbolise unyielding strength, whereas birds symbolise soaring over samsara and all the woes of life. The breastplate is actually known as a melong, which is a mirror made of polished metal and adorned with various jewels. In the center is the Tibetan syllable ‘hri’ which represents wisdom. Hence, the mirror represents the pure consciousness of Dorje Shugden. It is bright and clear, and as such it reflects images of the samsaric world but remains completely unaffected by those images, symbolising that all phenomena do not have intrinsic value but are empty of inherent existence. This is a symbol of the Buddhist view of emptiness, and something that all practitioners need to realise in order to gain enlightenment. The ring worn on the thumb of an oracle is used for two purposes. The first is that when Dorje Shugden or the other Dharma protectors enter the oracle, it is hard for them to speak. Due to the immense energy of the deity, there is a large toll on the oracle’s body, therefore he or she may not be able to speak clearly to pass on messages or advice to those assembled. Secondly, those in attendance may not have enough merits to hear Dorje Shugden speak through the oracle, or may have negative karma blocking them to hear his voice. 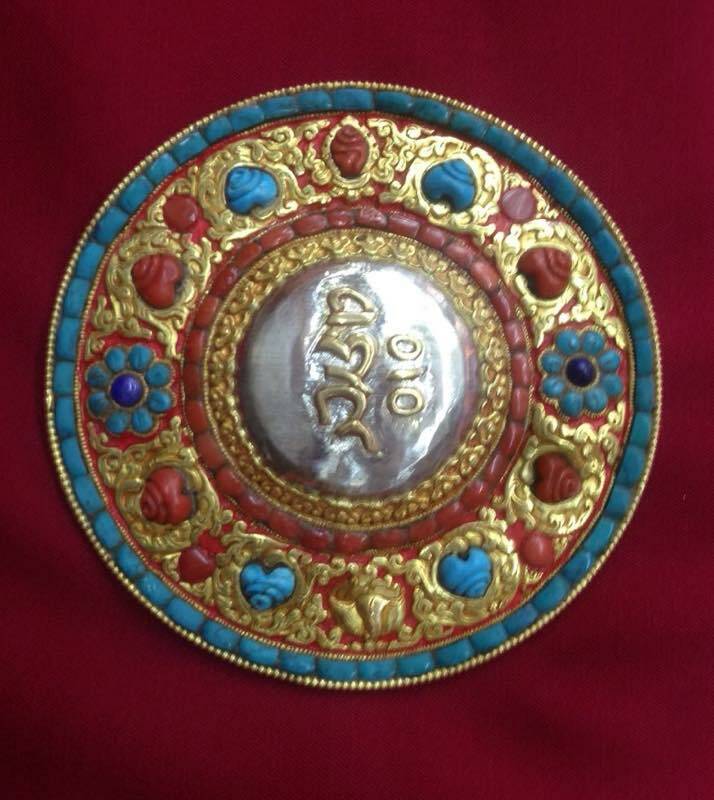 In this situation, and in fact during normal trances in which Dorje Shugden can speak, the oracle will use the ring to hit the melong/breastplate on his chest to signify he accepts the requests made, or as sign that he is happy with the people or person present. On the other hand, it is said that the oracle’s consciousness may reside in the ring when Dorje Shugden enters his body, and remains there for the duration of the trance, until Dorje Shugden has left, and the consciousness can return back into the body. 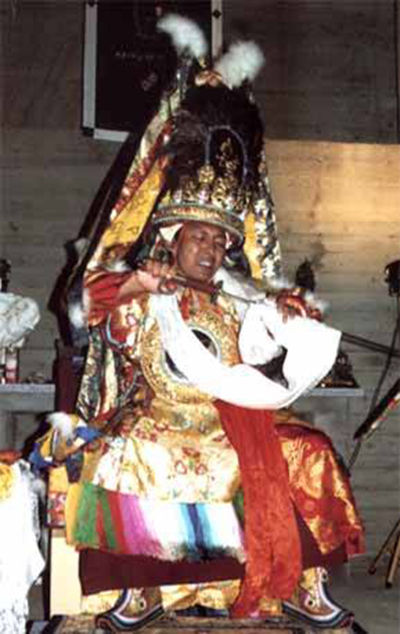 When an oracle takes trance of Dorje Shugden, he wears many layers of clothing, which are symbolic of Dorje Shugden’s qualities or as an offering to the protector. The boots represent that he has manifested in the worldly form of a deva in order to have a closer karmic connection with us. 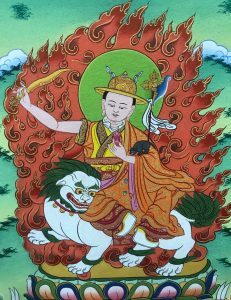 Since his form is closer to us, as compared to other Dharma protectors such as Palden Lhamo, Kalarupa or Mahakala, we are able to gain benefit through his practice much quicker, especially when in times of dire need. Traditionally if an oracle is a monk he would be wearing his monk’s robes or if he is a layman, he would be wearing a Tibetan chuba. On top of this is worn a golden robe made of heavy silks and brocades, as an offering to the protector. The robes here are meant to resemble a warrior’s armor. This offering is a request to Dorje Shugden to do battle with our negative karma, delusions and obstacles. This is emulated on the oracle statue as an offering to Dorje Shugden. 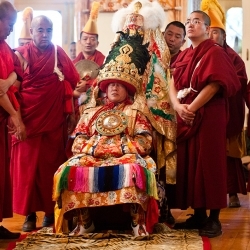 On top of this robe is a tule, a traditional top-garment worn by the deities in Tibetan Buddhism, made from brocades and sewn together to form a square with a hole in the center, and is worn over the head. 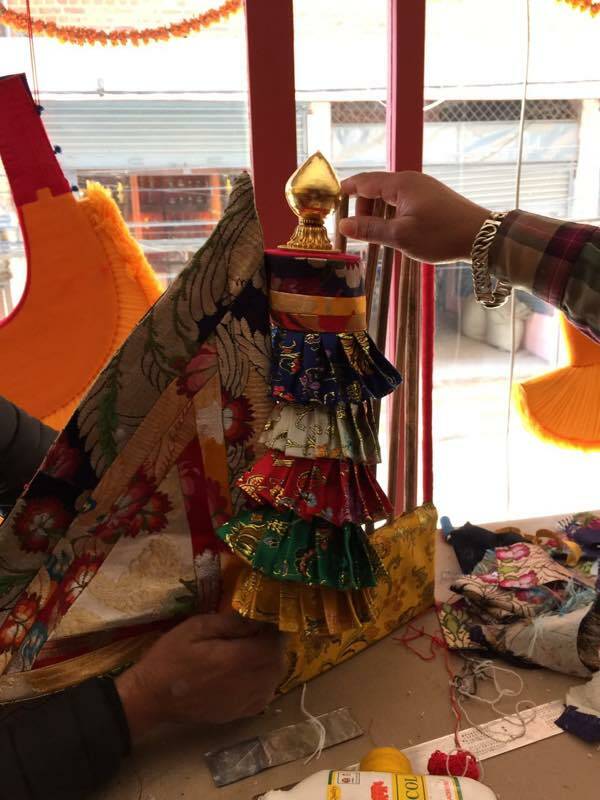 The various silks and brocades are all considered offerings to Dorje Shugden. Since Dorje Shugden is an enlightened being, making such offerings generates a great amount of merit. Since the oracle statue is considered to be a physical representation of Dorje Shugden, making such an offering onto the statue also collects merit in this manner. Out of his compassion, Dorje Shugden has many oracles in whom he takes trance to aid practitioners. 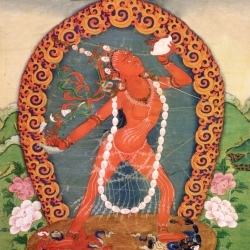 Many of these oracles are famous for their flawless trances, in which their bodies facilitate Dorje Shugden to give clear advice, bestow blessings, and perform miraculous works. There are currently five active Dorje Shugden oracles, two inside Tibet, and three outside of Tibet. 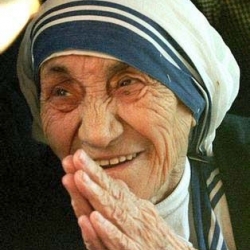 Here we have listed some of the most prominent oracles in recent history. The holy Choyang Kuten. Here we see him taking trance of the peaceful form of Dorje Shugden at Madhyamaka Centre, where he gave teachings and initiations. The Choyang Kuten was trained, observed and authorized by Kyabje Trijang Rinpoche and Kyabje Zong Rinpoche. Dorje Shugden was able to take trance in him in peaceful form, allowing him to bestow longer Dharma teachings and even bestow initiations of certain deity practices. Up until 1950, the Choyang Kuten resided in Phagri Monastery, Tibet. 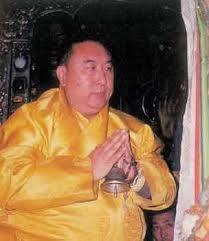 After escaping Tibet, he first settled in Buxa, North India and then re-settled in Gaden Monastery, South India. 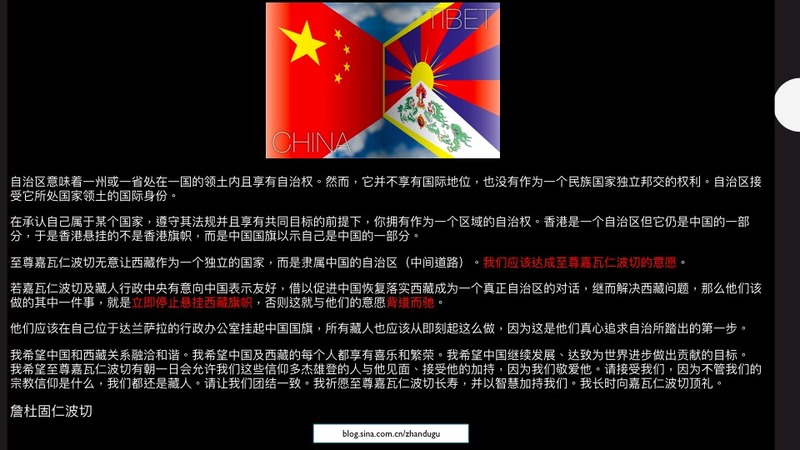 The Choyang Kuten was famous not only among the Tibetans in India, but all over the world. He is even known to have traveled to England, where he was hosted by his nephew, Geshe Kelsang Gyatso. It was there that he took trance of Dorje Shugden for those present. Dorje Shugden also entered in his peaceful form, gave Dharma teachings, composed a Long Life Prayer for Geshe Kelsang Gyatso, and even bestowed the initiation of Chenrezig. 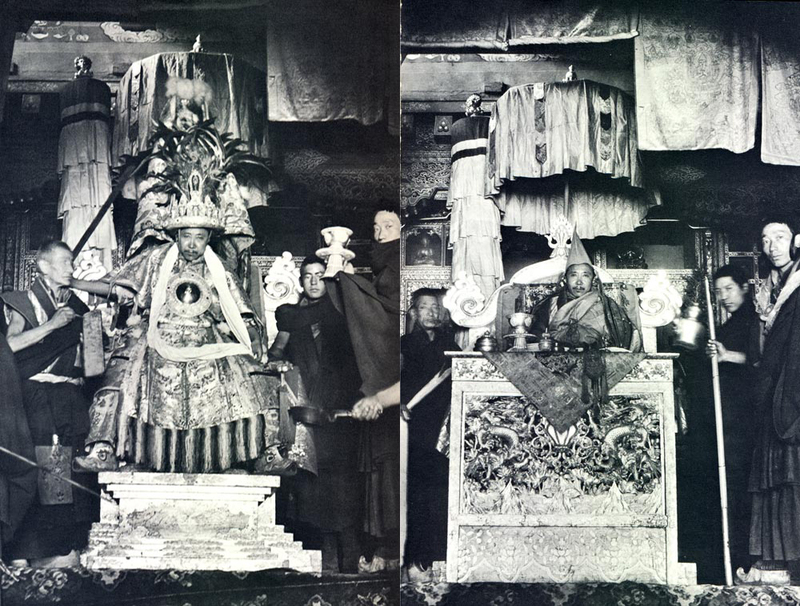 The Choyang Kuten preparing to take trance of wrathful Dorje Shugden (left), and in trance (right). The 6th Panglung Kuten lived in Tibet, was trained by Kyabje Pabongka Rinpoche, and was a highly influential oracle. Living in Panglung Ritroe, the hermitage of Panglung Rinpoche, he took trance of Dorje Shugden, Kache Marpo and various other high level protectors. The tradition of Panglung oracles means that the title is passed on from one oracle to the next. Therefore when the 6th Panglung Kuten passed away, his title and position passed onto the next Panglung Kuten, in this case, his son who became the 7th to hold the title. 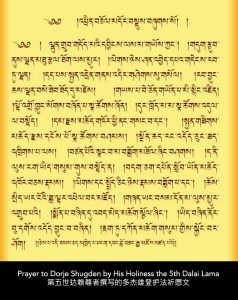 The 6th Panglung Oracle was very famous in Tibet for giving extremely clear prophesies that were highly accurate and treasured by many. 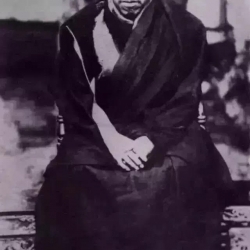 In fact, Kyabje Trijang Rinpoche consulted Dorje Shugden through the 6th Panglung Oracle in 1959 on whether the Dalai Lama should flee Tibet or remain behind. Dorje Shugden performed a Vajra Dance to clear obstacles, handed over his sword and instructed the Dalai Lama to leave Tibet immediately, and that the escape party should carry his sword at the head of the party for a safe and successful trip. Son of the 6th Panglung Kuten, the famous oracle of Dorje Shugden performing the black tea offerings, before a trance session in Kechara Forest Retreat. 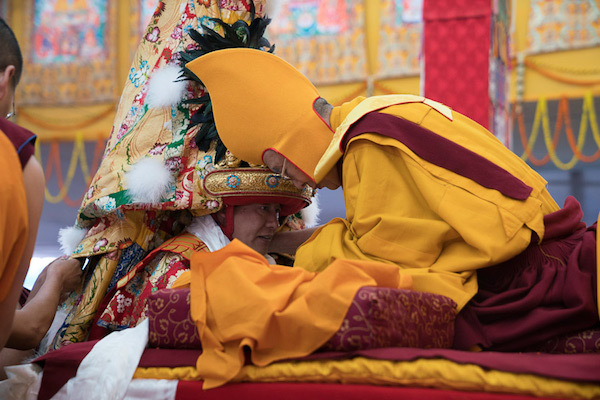 The 7th Panglung Kuten, originally from Sera Monastery, was personally trained, consecrated and authorized as an oracle by Kyabje Trijang Rinpoche. His other teacher was Domo Geshe Rinpoche. He takes trance of Dorje Shugden, Kache Marpo, Setrap, and other Dharma protectors. 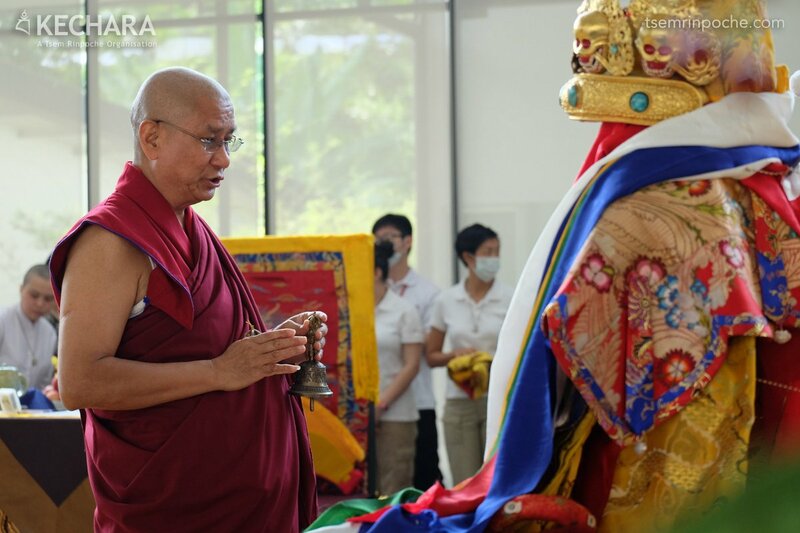 On June 21, 2015, the Panglung Kuten took trance of Dorje Shugden and Kache Marpo in Wisdom Hall, Kechara Forest Retreat. During the trance session, over 700 people had the privilege and merit to meet and receive blessings from the powerful protectors. 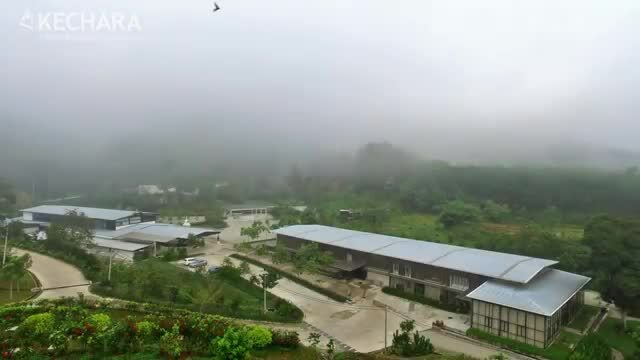 On December 25, 2016, the Panglung Kuten once again returned to Kechara Forest Retreat, at which point the Kechara Organisation had the merits to offer him a newly constructed Panglung Ritroe, the official residence of the Panglung line of oracles. 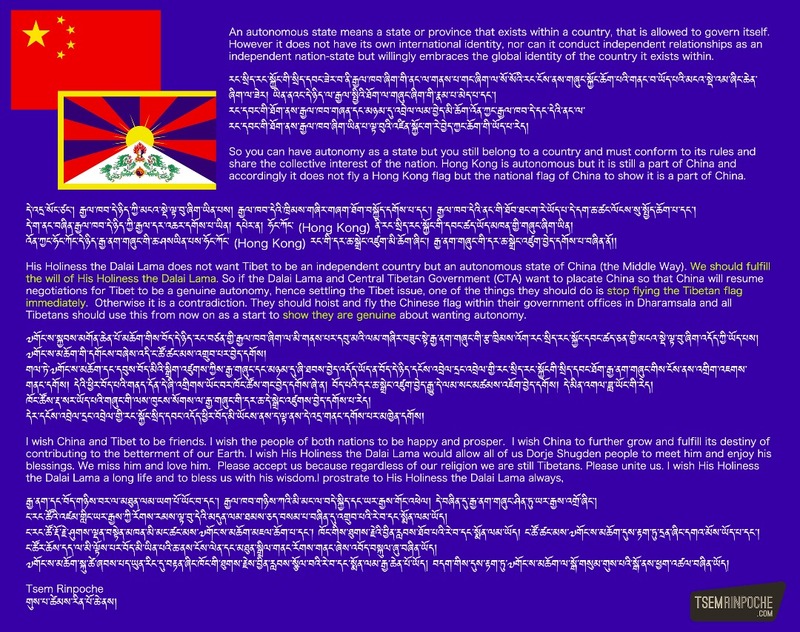 This was in commemoration of the original Panglung Ritroe of Tibet, which was home to the Panglung Rinpoches and the lineage of Panglung oracles. It was also where the 6th Panglung Oracle had advised that the Dalai Lama leave Tibet in 1959. 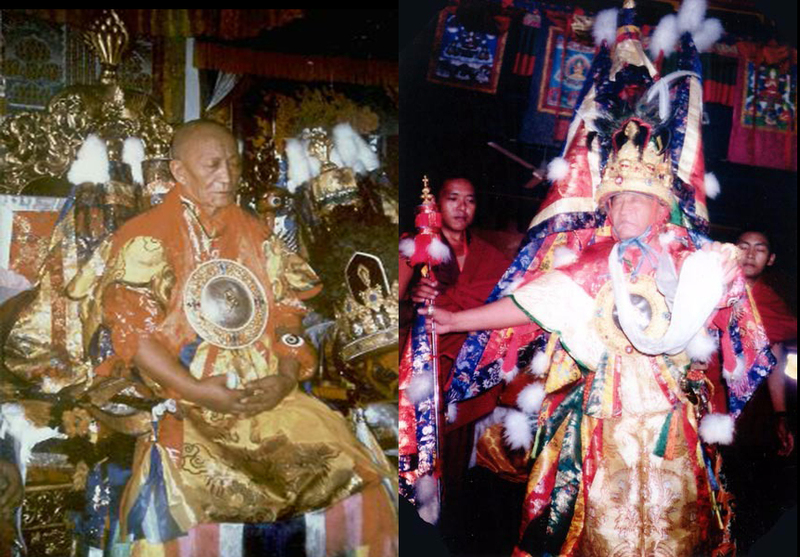 The Dungkar Oracle in wrathful trance of Dorje Shugden (left) and peaceful trance of Dorje Shugden (right). 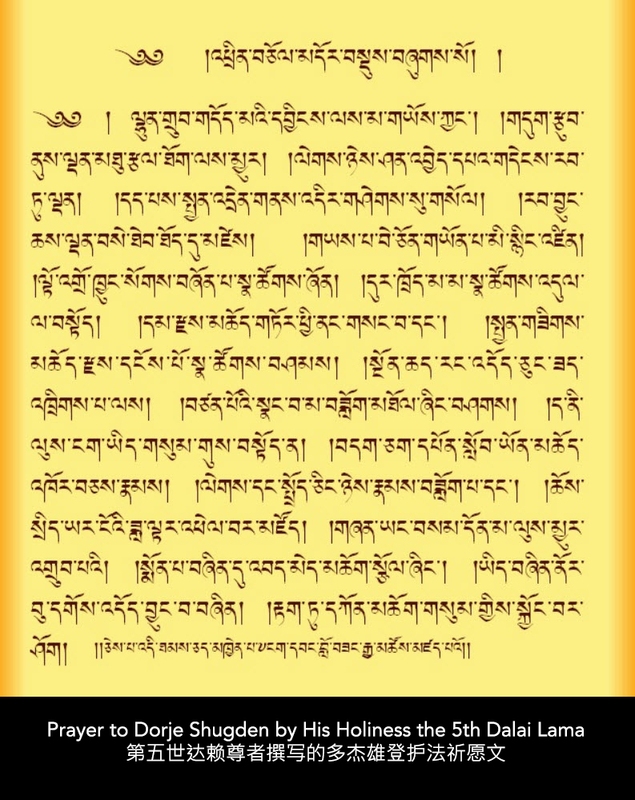 The oracle of Dungkar Monastery was trained, consecrated and authorized by Domo Geshe Rinpoche. 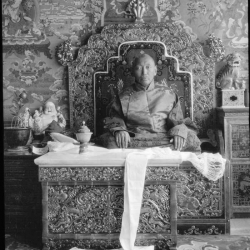 It was under the direction of Domo Geshe Rinpoche that Dungkar Monastery became the seat of this particular oracle who became famous, and was consulted by people from all over Tibet. 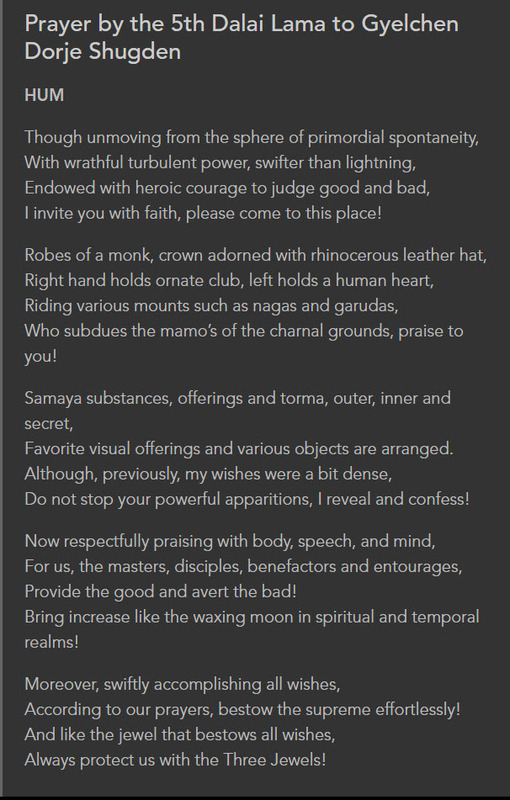 This oracle could take trance of Dorje Shugden, Kache Marpo and Namkar Barzin. An interesting point to note is that it was through this oracle that Lama Zopa Rinpoche was confirmed as a tulku, or reincarnated Buddhist master. 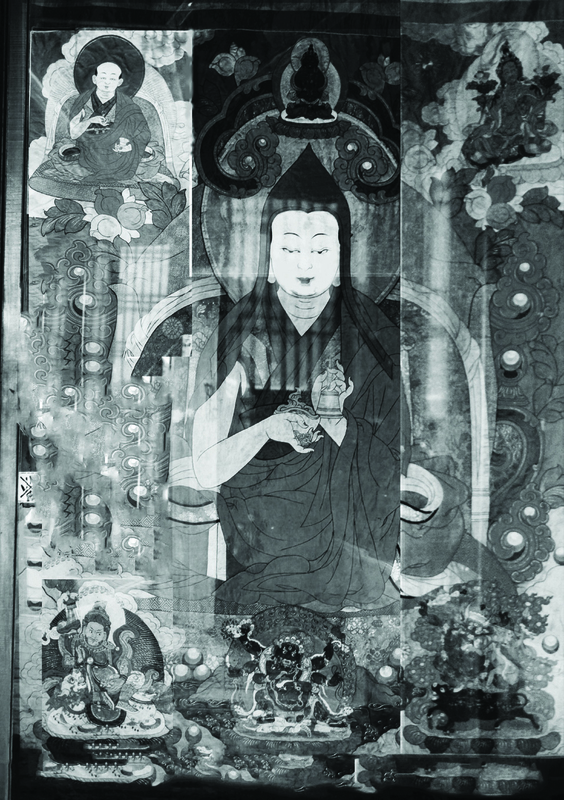 It was after meeting Dorje Shugden via this oracle that the young 14th Dalai Lama composed a praise to Dorje Shugden while staying at Dungkar Monastery. The Ari Kuten is a student of Kyabje Zong Rinpoche and Dagom Rinpoche. When he was in his early teens, Kyabje Zong Rinpoche had predicted that he would become an oracle of Dorje Shugden when he was older. 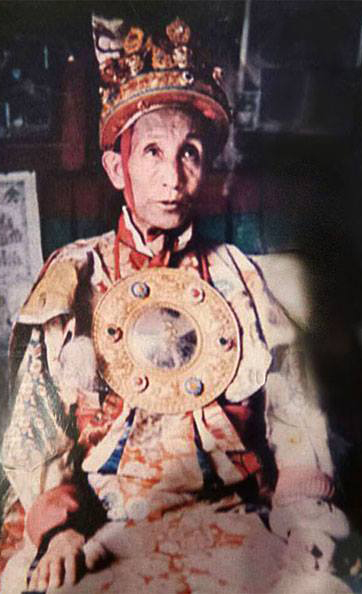 This prophecy came to pass with the Ari Kuten being officially recognized as the Dorje Shugden oracle of Gaden Monastery, shortly before the ban on the practice of Dorje Shugden was imposed by the Tibetan government in exile. 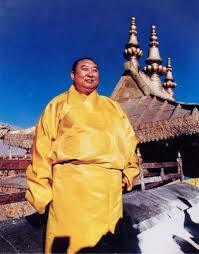 His first set of oracles clothes were sewn together by Kyabje Zong Rinpoche himself. The Ari Kuten, which means ‘American oracle’ recently opened a large Dharma center in Bloomington, Indiana, named Gaden Kachoe Shing. The Simla Kuten in full trance in front of Kyabje Trijang Choktrul Rinpoche. The Simla Kuten was a student of Kyabje Ling Rinpoche who lived and served in Ling Ladrang (Household of Ling Rinpoche) for over 15 years. He was blessed, trained and authorized as an oracle by Kyabje Trijang Rinpoche. The Simla Kuten for over 40 years took precise and perfect trances of wrathful Dorje Shugden and peaceful Kache Marpo. He was highly sought after and lived in Simla, North India. He was a very gentle and a kind monk and he also took perfect trances for various monasteries and individuals during his lifetime. 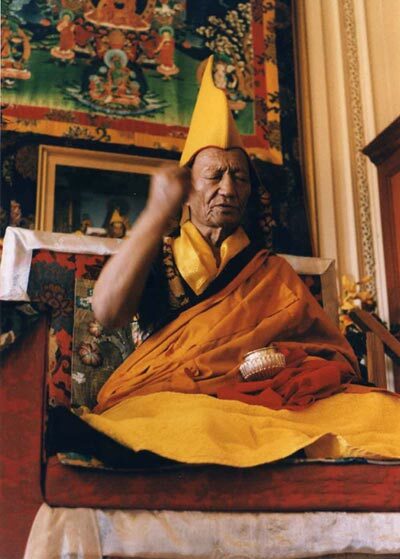 His Holiness Kyabje Ling Rinpoche trusted Dorje Shugden very much and consulted Dorje Shugden through the oracle. 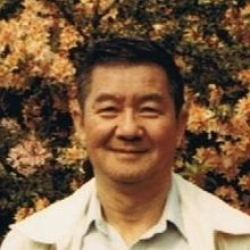 He had a Dorje Shugden oracle living in his own residence, Ling Ladrang. 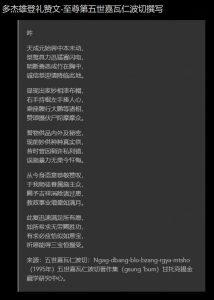 Ling Rinpoche even composed prayers to Dorje Shugden. An oracle of Dorje Shugden taking trance in the private residence of Kyabje Dagom Rinpoche (Dagom Ladrang) in Nepal. 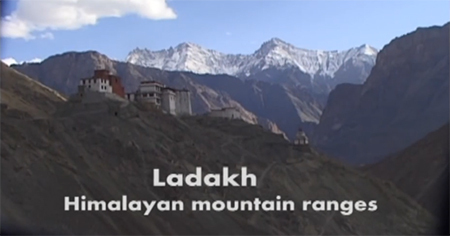 This oracle hails from the Ladakh region of northern Indian state of Jammu and Kashmir. He was trained as an oracle by Kyabje Dagom Rinpoche personally. The Kalimpong Oracle was a lay Tibetan man by the name of Lhagpa Dondrub and he took trance of Dorje Shugden, Kache Marpo, Namkar Barzin, Jowo Chinkarwa and another minor protector deity, Pawo Trobar. He was born in Tenge Dzong, which is near the Sikkim-Tibetan border. He naturally had the ability to take trance and had been taking trance since he was sixteen years old. 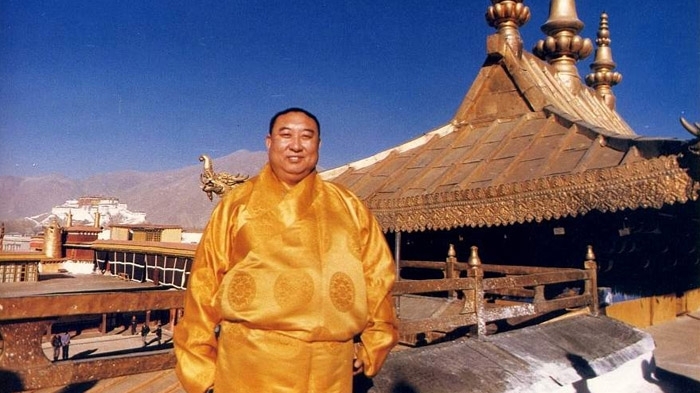 He was said to have accepted the request of Dorje Shugden to be trained officially at the famous Dungkar Monastery founded by Domo Geshe Rinpoche in the Chumbi valley, where he resided for eight years. After that, he stayed in Drepung Monastery in Central Tibet and eventually found himself in Kalimpong. Despite his extended stay in the monasteries, he remained a lay oracle and got married. In his house, he had a shrine room, in which he had various images of protector deities. One of these was a big statue of Dorje Shugden, which he had made himself. Oracles provide a direct connection to the divine. Here we see His Eminence Tsem Rinpoche paying his respects to Dorje Shugden, who had taken trance of the 7th Panglung Kuten in Kechara Forest Retreat. His Eminence Tsem Rinpoche has a close and intimate connection with the Dharma protector Dorje Shugden. This is exemplified by his affection with Dorje Shugden when in trance in various oracles. Tsem Rinpoche’s intimate relationship with Dorje Shugden stems from his previous incarnations. 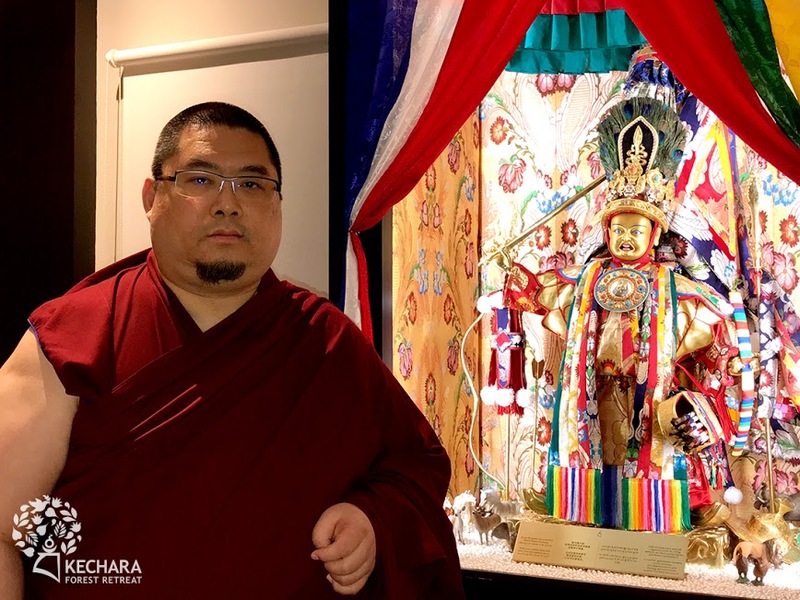 Tsem Rinpoche has had a very close connection to Dorje Shugden as his personal protector for the past few incarnations. Tsem Rinpoche was well known in his immediate previous incarnation as Kentrul Thubten Lamsang, who was a lama who blessed people, cleared their channels and made them oracles. 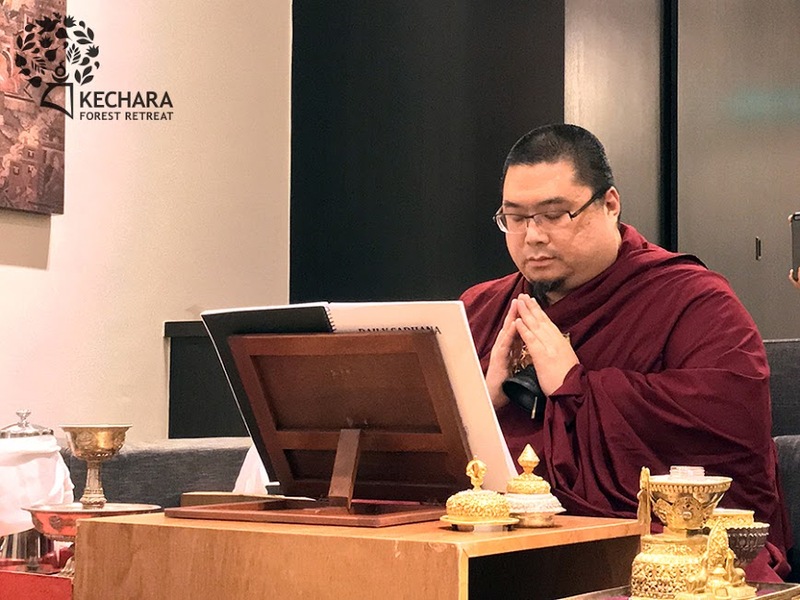 Tsem Rinpoche’s previous life in Phari had blessed and trained two individuals to become oracles as recounted by his old students in Gaden Monastery. He was well-known to be an ‘oracle-making’ lama. In the videos below, you will see examples of their close and intimate connection. In 2016, Kechara Forest Retreat in Malaysia was blessed to receive the 7th Panglung Kuten. 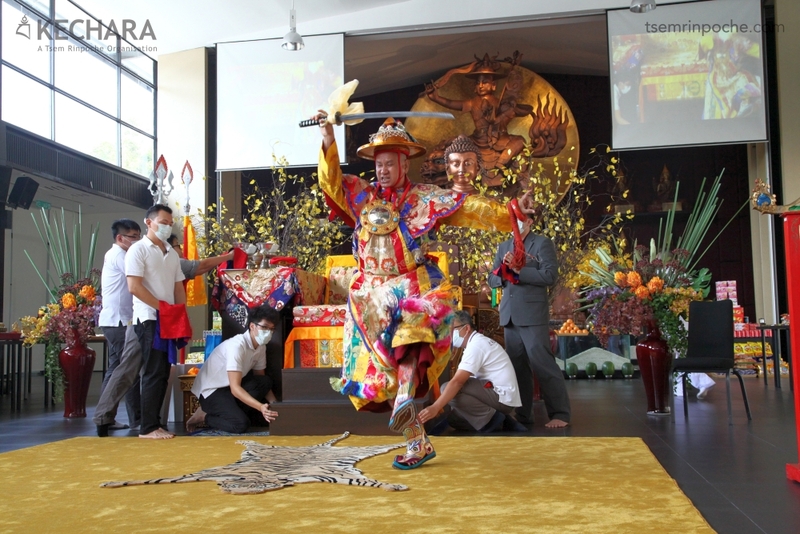 The oracle had arrived to engage in various prayers and rituals for Kechara and the Dharma in general as directed by the advice of Dorje Shugden. It was during this visit, that Dorje Shugden took trance in front of over 700 people who gathered to seek his blessings. In the video, you can see the close relationship between His Eminence Tsem Rinpoche and Dorje Shugden by their body language and the respectful manner in which they communicate with each other. The video below shows Tsem Rinpoche’s closeness to Dorje Shugden through three separate oracles, two of whom took spontaneous trance and greeted Tsem Rinpoche as close friends would. The first is the Sera Oracle. 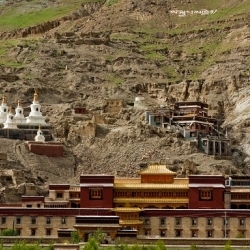 When Tsem Rinpoche was visiting Tibet, it came to be known that he was in Lhasa. The Sera Monastery oracle-in-training, the changtso (liaison) of His Eminence Denma Gonsa Rinpoche and a few other monks waited hours to have an audience with Tsem Rinpoche. It was during this audience that Dorje Shugden suddenly entered the oracle-in-training. The second is of a monk from Nemo Gyelche Monastery. During an impromptu and unplanned visit to the monastery Tsem Rinpoche was greeted by a monk who took spontaneous trance of Dorje Shugden. Once again this event marks the incredibly warm and loving relationship that Tsem Rinpoche and Dorje Shugden share. To download high resolution versions of these pictures, please click here. 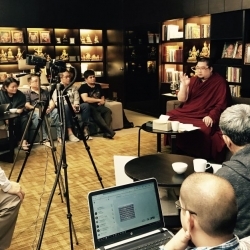 During Tsem Rinpoche’s visit to Lhasa, some monks had requested an audience with him in his hotel room. Among them was an oracle who took spontaneous trance of Dorje Shugden. When in trance, the oracle jumped up and down happily and hugged Tsem Rinpoche affectionately. 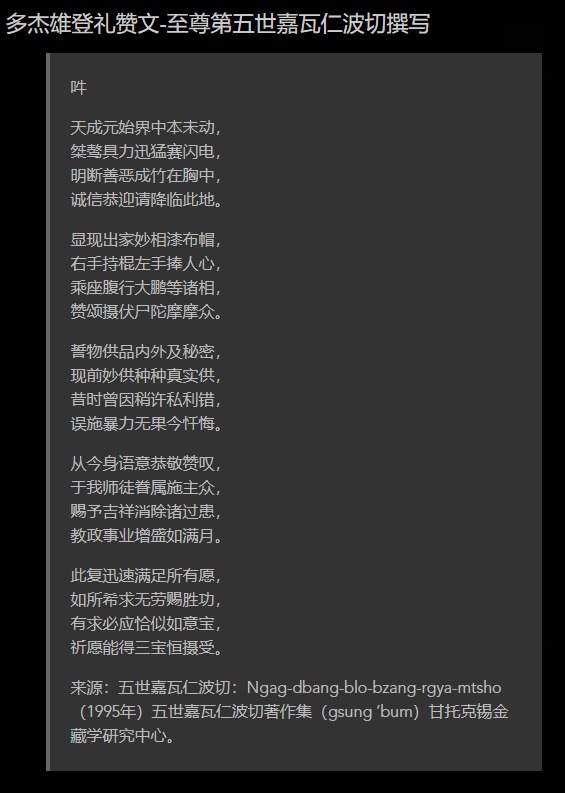 Through the oracle, Dorje Shugden also asked Tsem Rinpoche to bless the oracle’s channel in order for him to speak more clearly. 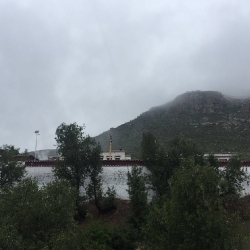 On the way to Shigatse from Lhasa, Tsem Rinpoche’s tour guide informed them about Nemo Gyelche Monastery, and Tsem Rinpoche decided to visit the temple on the spur of the moment. Tsem Rinpoche had no knowledge of the monastery prior to the trip, and was dressed in lay clothes because he did not want to attract attention. 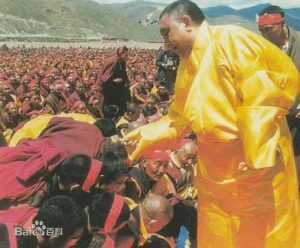 If people had known he was a Rinpoche, many people would have come forth and asked for blessings. Tsem Rinpoche first made offerings at the main altar and then adjourned to the protector chapel next to the main prayer hall. The oracle of the monastery immediately took spontaneous trance and hugged Tsem Rinpoche affectionately. Tsem Rinpoche put a khata around the oracle and introduced the people in his group to Dorje Shugden in trance of the oracle. 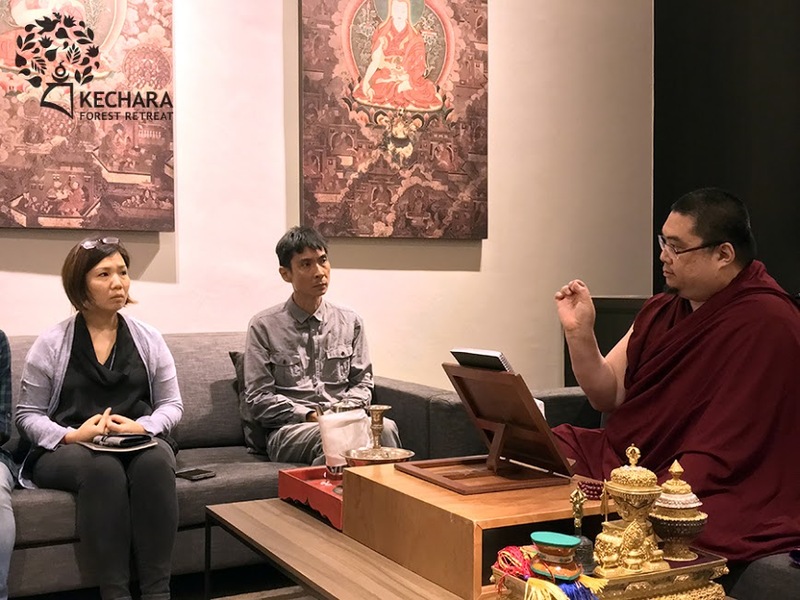 Seeing the interaction between Dorje Shugden and Tsem Rinpoche, the monks of the monastery realised Tsem Rinpoche was a high lama and invited him to a meeting room upstairs. There the monks made offerings and prostrations to Tsem Rinpoche and served him tea. The oracle was also there and when he made offerings, Dorje Shugden again took spontaneous trance and made offerings to Tsem Rinpoche. However, this part was not captured in the video. Although Tsem Rinpoche had never been to the monastery or even knew it existed, the oracle took trance of Dorje Shugden, showing his clairvoyance and greeted Tsem Rinpoche as he always does, with great affection. Tsem Rinpoche has introduced so many ancient and authentic Dharma practices to us. I wouldn’t have known about Tsongkhapa or Dorje Shugden if it was not because of Tsem Rinpoche. Another very unique Tibetan Buddhist tradition Tsem Rinpoche has introduced to us is the Dorje Shugden oracle. I used to think medium or taking trance is not a Buddhist practice. But in Tibetan Buddhism, a trained person is able to take trance of an enlightened being such as Dorje Shugden. At first, I find it unbelievable but after seeing so many footages and also the results of the lamas who relied on Dorje Shugden, I believe it is real that Dorje Shugden can give us advice via the oracle. It is said that the advice given by Dorje Shugden is extremely useful and it can help to solve our problems. If we are not able to meet the oracle to have an audience with Dorje Shugden for his advice or blessings, we can create the cause by making an offering to the Dorje Shugden oracle statue in Kechara Forest Retreat (KFR). 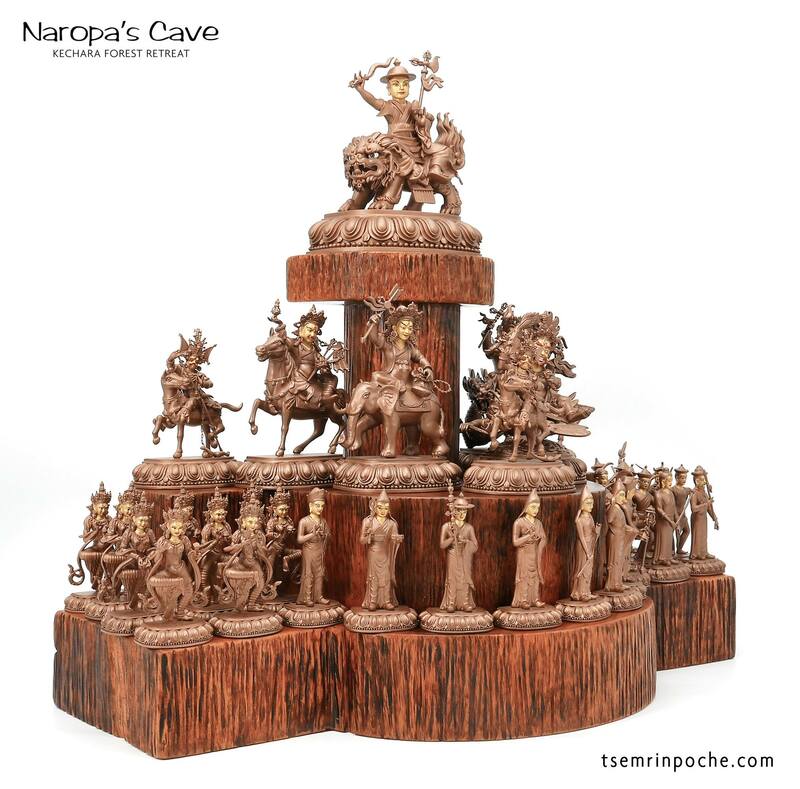 Tsem Rinpoche has kindly commissioned this statue and invited Dorje Shugden to reside in it in order for us to create the cause to be connected to him. 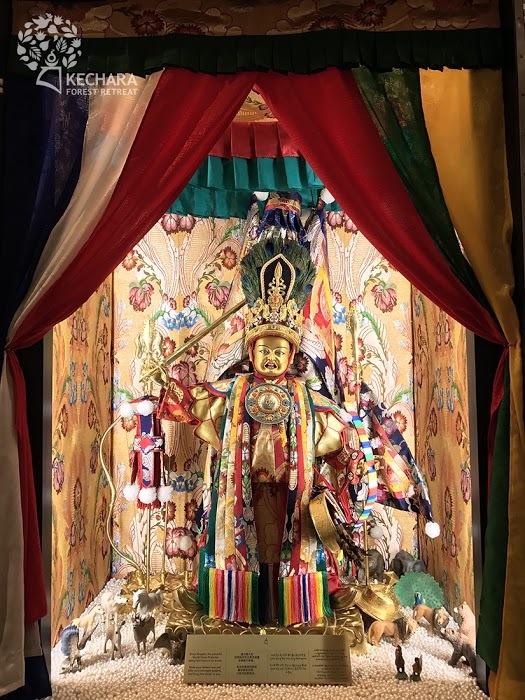 The Dorje Shugden oracle statue is one of its kind in the world, remember to offer a Khata to the oracle statue the next time when you go to visit KFR. Oracles provide a direct connection to the divine. Therefore when we rely on the tradition of oracles we are able to receive blessings and advice for our various needs. Without oracles, practitioners like us who are without the higher attainment of being able to communicate with the deities directly, would be bereft of such benefit. Oracles in Tibetan Buddhism are normally highly trained and qualified for their roles.This is important and necessary.There are decisions and questions in our lives that are important and are beyond logic and ordinary thinking. For these,we need to consult a qualified oracle in trance of a protector. 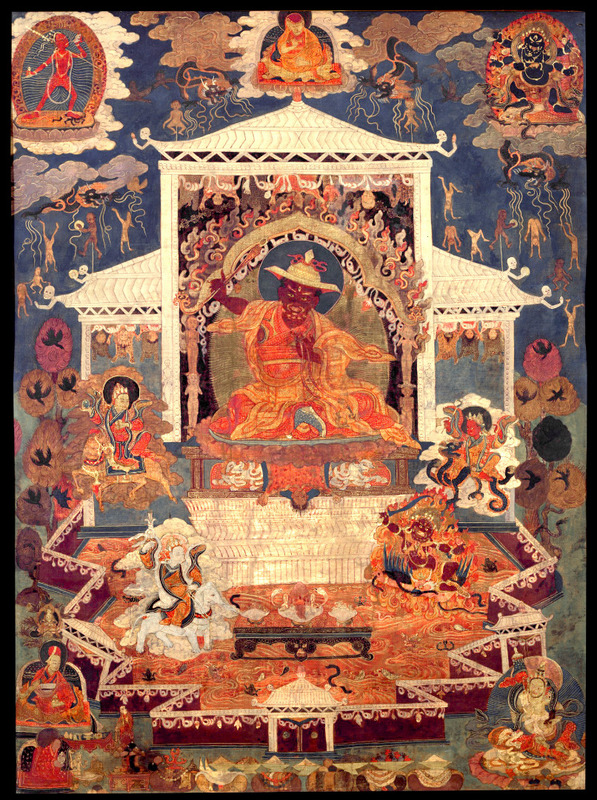 The oracle discussed here in this blogpost is the oracle of Dorje Shugden, the Dharma Protector for whom beings of this degenerate age have such great affinity to and depend heavily on. Oracles facilitate our direct contact with Dorje Shugden, who has unfailingly guided us through every turn and uncertainty in our lives. I am most happy that Tsem Rinpoche was inspired, by seeing an oracle statue in Nechung Monastery over 25 years ago, to have a similar oracle statue of Dorje Shugden made so that people can pray and create the powerful affinity to have audience with Dorje Shugden, be blessed by his divine presence, and have the great opportunity to listen to his divine speech. 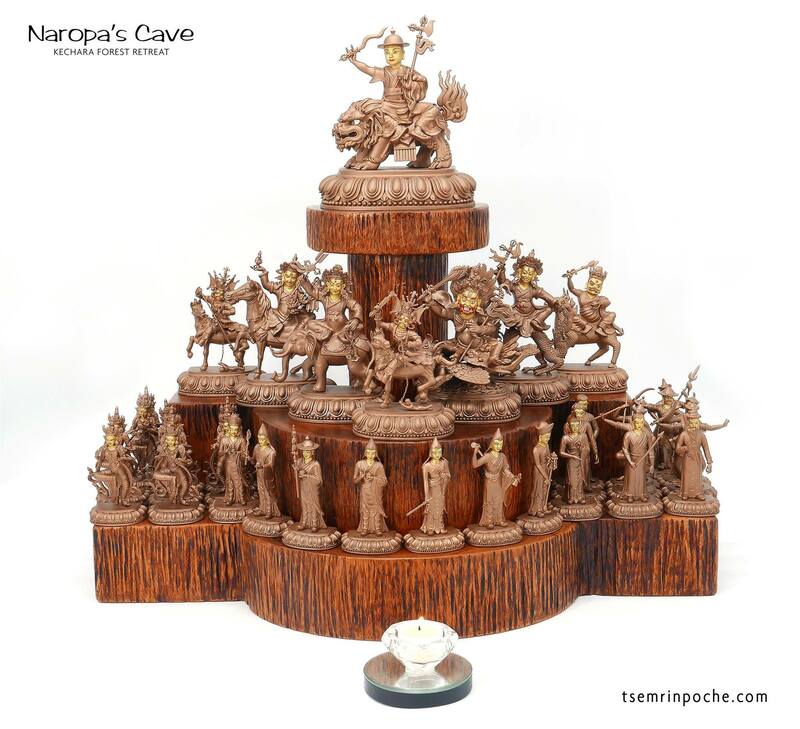 Having a Dorje Shugden oracle statue will create the cause for an oracle of Dorje Shugden to arise so as to benefit many beings. 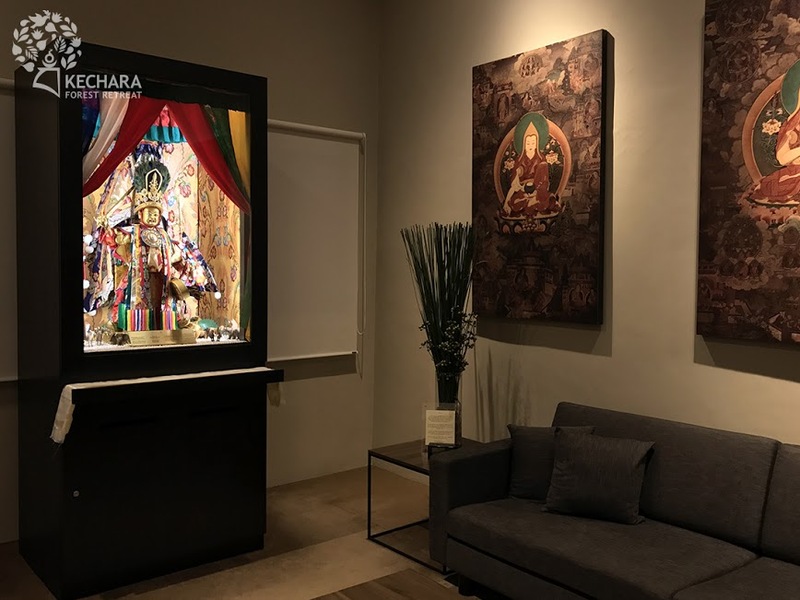 The Dorje Shugden oracle statue, the only one of its kind in the world, is is currently enshrined in the Wisdom Hall Audience Room, at Kechara Forest Retreat in Malaysia. 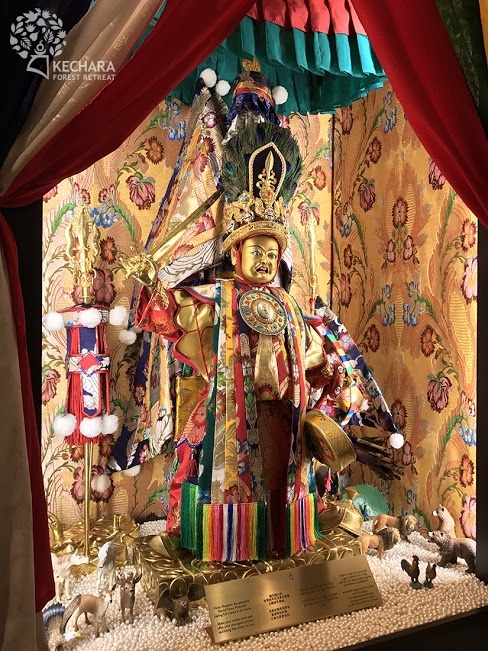 As an oracle statue which has been consecrated, it can be prayed to in order to create the causes to be able to communicate with Dorje Shugden in the future. 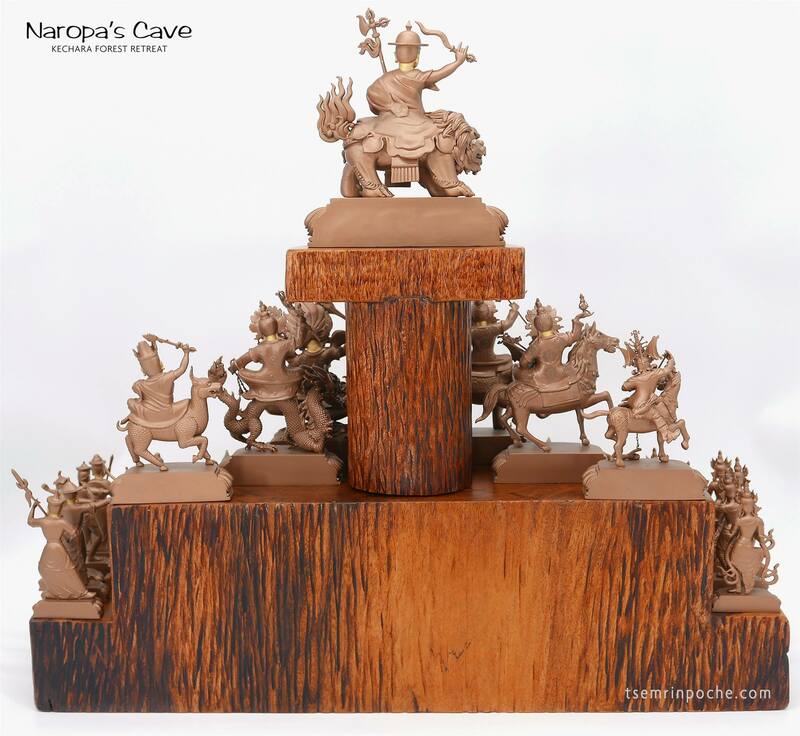 Having this oracle statue here, which is the embodiment of Dorje Shugden, shows how close we are to Dorje Shugden,our beloved Dharma Protector. 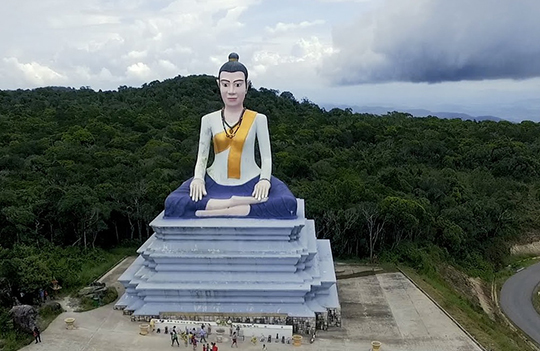 Thank you ,Rinpoche, for your great kindness and compassion in having this statue installed here in Kechara Forest Retreat to create the cause for the blessings of Dorje Shugden to continue to spread in the ten directions. Oracles have been such an essential part of most civilizations that exist today. From this article it seems that oracles, or mediums transcend across all cultures where the ordinary human beings seeks to predict the future (near and far), to seek prophesies, to now the future and to seek “divine” guidance or to seek intercession in matters related to the spiritual. 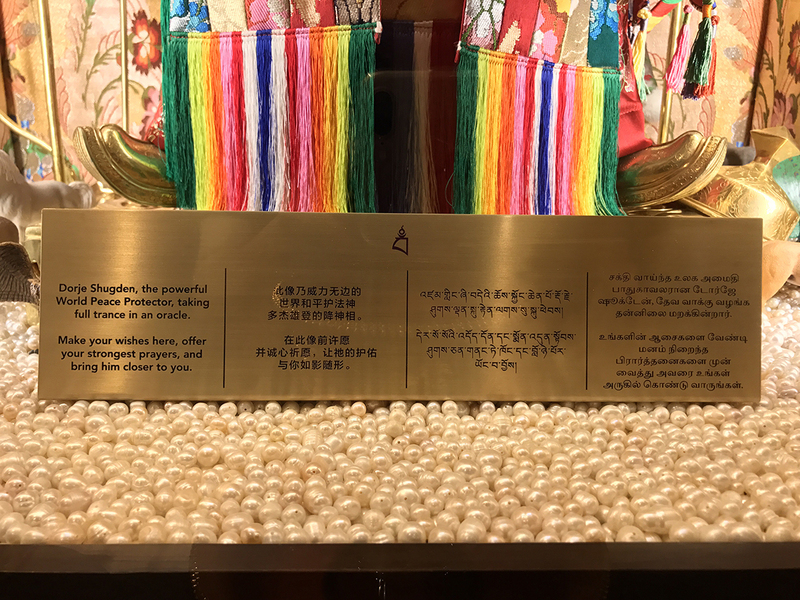 It is also indeed very blessed and meritorious to have the world’s first Dorje Shugden oracle statue right here in Malaysia for all to connect with DS and continuously be connected. Thank you Rinpoche for your kindness in making available for all to connect and to allow us all to generate merits. May KFR grow and may the ban on DS be lifted soonest. Scientists and mathematicians have already realized and proven that there are many planes or dimensions that we are not able to fathom but that do exist. To be able to experience the divine communicating directly to us via an oracle vessel is truly an attestment to this fact. However, as the article explained, we must be careful to ascertain the entity that takes over the body of the oracle for while there are compassionate beings, there are also selfish ones, just like if there is light, there must be darkness. I have watched quite a number of video recordings of oracles taking trance and have personally witnessed it once myself. I must say on balance, there must be something to it so to speak. 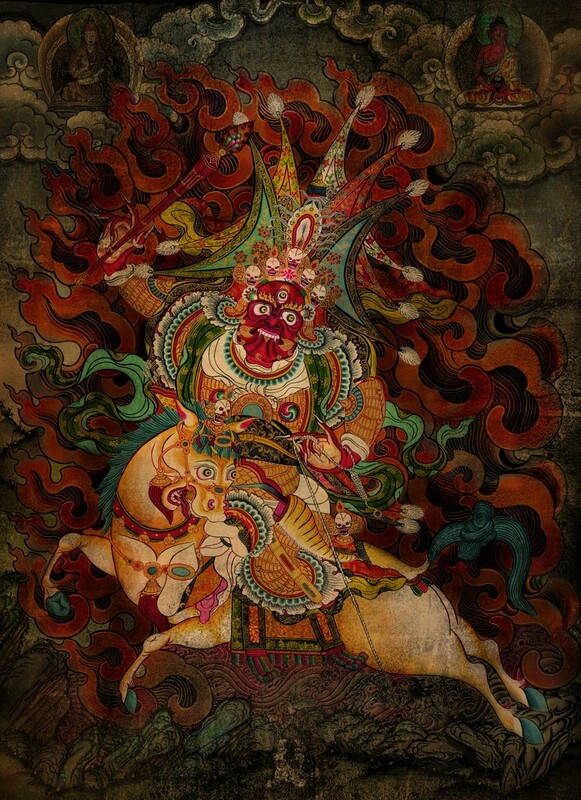 Dorje Shugden is Wrathful Manjushri. To be in the presence of an oracle and even get teachings and blessings is not something any person can do. Dorje Shugden cannot be bribed or coerces to do something non beneficial. As seen from countless videos when Dorje Shugden takes trance,he is always pleased with Lamas and teachers who bring dharma to countless others and is very affectionate like a father for his only son. Usually Dorje Shugden will manifest how pleased he is to others very clearly. May the tradition of beneficial oracles arise in Kechara Forest Retreat for the benefit of many sentient beings. Good. I believe in oracles. Well explained.very much impressive.letme make avisit to the tetreat on my next visit to malaysia.im going to have my eye operation next week .Guruji pl pray for the well being and blees me .Thank u. Some peoples thought that to believe in Medium or oracle is a blind faith or a kind of superstition, but, nevertheless people are still relying on medium especially when the problems they face can’t be resolved easily. I agreed with the article where, if we think enlighten beings can’t take trance, we are limiting the potential in an enlighten beings with our own limited ways of thought. Enlighten beings like Dorje Shugden is so compassion. They take trance in oracles so that we have chances to get close to Dorje Shugden, get blessing and seek for advice. Seeking advice from an enlighten being is more save, because enlighten being like Dorje Shugden can give advice to us while he could check our past and future karma. We are lucky that in this age of time that this traditional is still passing down and the oracle is still going through the authentic training. In the Dharma talk given by Rinpoche, I further learned that Dorje Shugden could take trance because He has very strong Karmic connection with us. We can’t see Dorje Shugden directly, thus, when Dorje Shugden take trance to oracle then only we can see and even have chances to talk to Dorje Shugden. Dorje Shugden is very kind; he took trance to bless us at our level. Before I read about this article, I thought that to become an oracle is an easy task. In Tibetan Buddhism, to be an oracle or to train to be oracle need so much passion, patient and commitment. From the choosing process to the training and finally be a qualified oracle, is guided step by step with many retreat, pujas and meditation by lama. To me, only a person who really want to benefit people or have pure heart, he can then be the oracle. I remember in June year 2015, I have a privilege and great merits to have audience with Dorje Shugden through Choje-la. 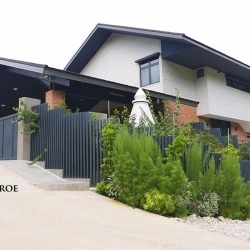 Choje-la took trance of Dorje Shugden’s and present in Kechara Forest Retreat. It is amazing that we can be so close to Dorje Shugden, and , without Choje-la who took the hardship going through all the oracle’s training, we will not have the chance to have audience with an enlighten being. And these can’t be happened if we do not have H.E Tsem Rinpoche’s kindness to give this gift to us. 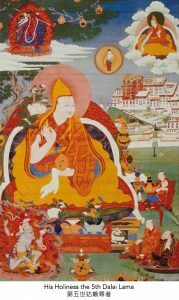 In this article I have learned that our guru, H.E Tsem Rinpoche was known to be “oracle-making” lama in his previous life. Even until today, through various occasion from the recording videos- whereby the oracle will come to Rinpoche to get Rinpoche’s blessing for them to take trance effectively. Not only that, seem that whenever Rinpoche stay, Dorje Shugden will come to Rinpoche. Rinpoche is very compassion to bring the oracle knowledge to Malaysia. By having an oracle statue, we could have an oracle in the near future. 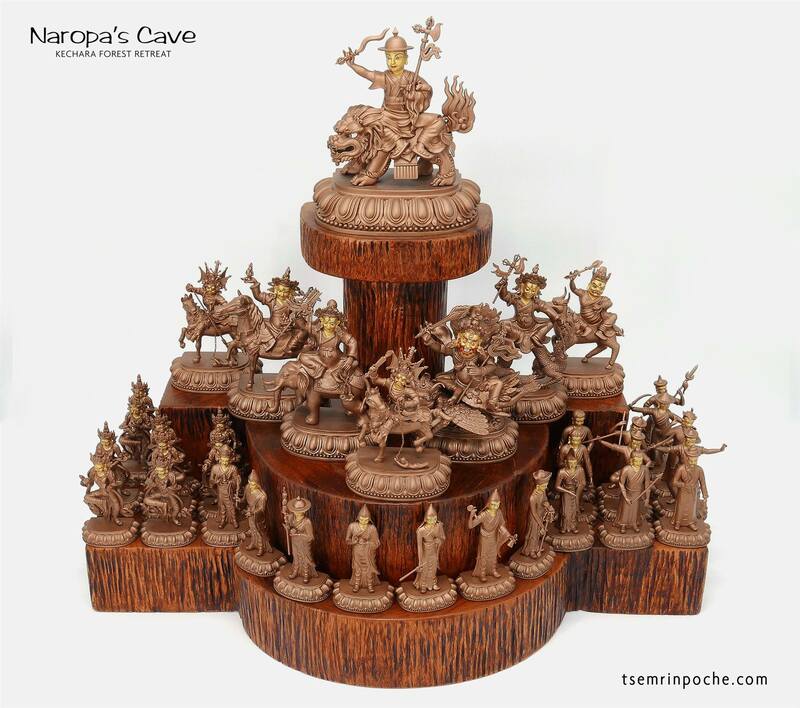 The Oracle statue is not just a statue; it is an opportunity for us to link with Dorje Shugden. Thus, the making of the statue are in correct proportion. 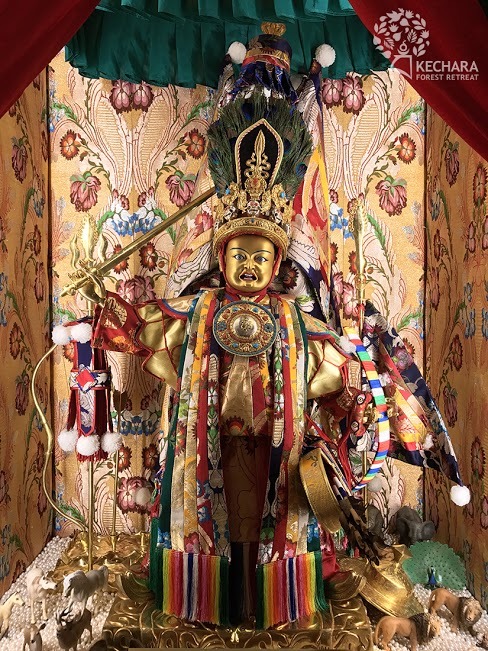 In this oracle statue, we can see that the oracle hold a normal straight sword, I learned that this is an indication that Dorje Shugden is none other than Manjushri himself. 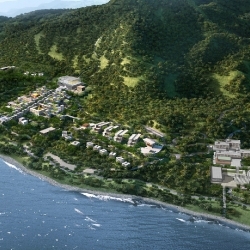 Hopefully we can have an oracle from Kechara Forest Retreat in the near future. Thank you Rinpoche for teaching us. Truly treasure. So much efforts to make this one of the kind Oracle statue. Information about the Oracle are comprehensive and good to know. I have a very bad experience with Medium. Whenever I saw any medium take trance of various deities, I will t run away from him. I just feel that this is not true, it is just some spirits entered to the medium body and act they are the deities or god. Due to this, when someone talk about oracle, I refuse to listen and accept. Until I heard from Tsem Rinpoche teaching about oracle and it was completely new to me. After this, I research to read more and begin to accept that the oracle we are mentioning is not an ordinary oracle. The true oracle himself has gone through a very intensive training and retreat and they are pure compare with the one I met. Moreover in 2016, Kechara Forest Retreat in Malaysia was blessed to receive the 7th Panglung Kuten. It was during this visit, that Dorje Shugden took trance in front of over 700 people and I am one of them to receive his blessings. For those who would like to know about the oracle, I recommend you read this article because it provides comprehensive information and its proven. This oracle statue is ready well make and alive as real oracle. Thank you Rinpoche has sharing orale history blackground and informative compehensive about oracle in Tibet. In this article also explain how tibet oracle training especially oracle who can take trance of enlighten being need to do a lot of retreat and practice to make sure their body is pure when they take trance. We can see those orale who taking trance of enlighten protector are mostly monk. This is show oracle must holding their samaya and vow closely with their guru. Those who not vist Kechara Forest Retreat quickky come to get blessing. This statue has consercate by H.E. Tsem Rinpoche with a lot of prayer , puja and highly bless. For people who does not know the story behind this statue will be fascinated by the beauty of this Oracle statue, for those who know it, will have more faith and appreciate the existence of this statue, but whether we know or don’t know, when we look at the statue or to make offering to the statue, we have already get blessed by him. 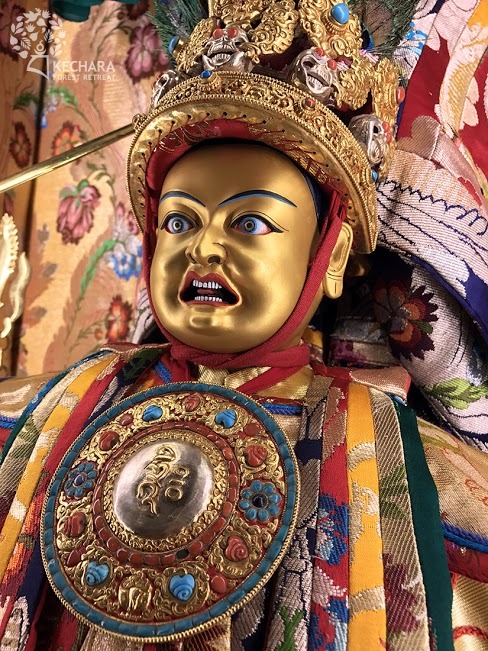 There are a lot of detail and precious info about the oracles, by learning from this article, it enable us to go share with others and allow them to gain faith to our greatest protector – Dorje Shugden. 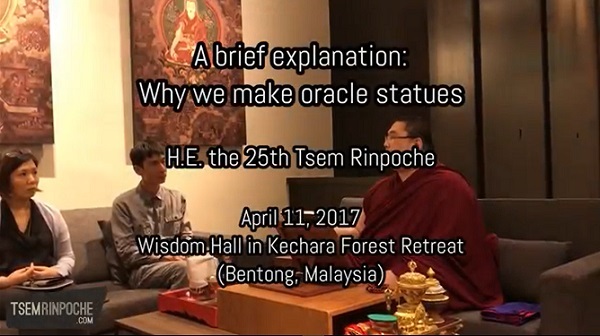 Thank you Rinpoche for sharing such detailed information for us to learn, just about the oracle statue alone, there are already so much to learn and understand. When I first look at statue in audience room, I was stunned by the beauty and I could feel a little chilled when I get a closer look. I felt a little funny when I see some animals around the statue instead of ritual items. After reading this article, I understand it gives so much meaning. It’s unique, rare and the statue looks so much alive! I love the fine details of the craft especially the domed hat and oracle clothes. As far as I know about taking trance is a quite scary thing. A person who took trance will lose his consciousness and he will never know which deity will enter his body. There is one true story told by a friend, where her male friend took trance of Zhu Bajie and he ate dirty damp food, which ended him up in hospital. I agreed that, one person should have a proper guidance and training before taking trance blindly. Thank you Rinpoche, for sharing such informative article. Thank you Rinpoche for posting this article. After reading this article, it let me understand there are so many oracle in different religion. It’s impressive that even back to the time in ancient Greece, there already had oracle. 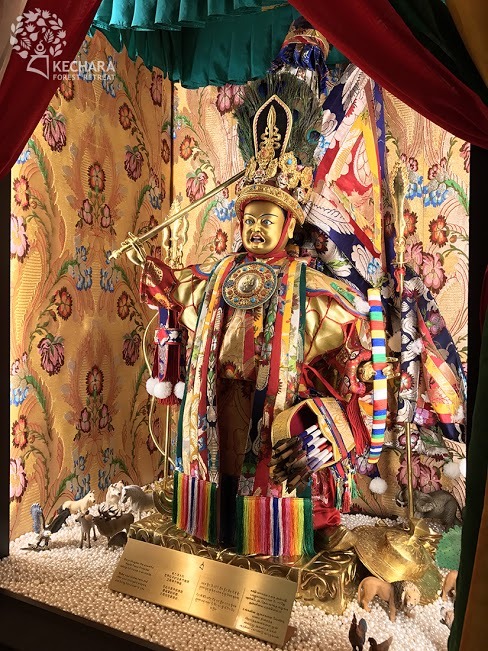 Dear Rinpoche, Thank you for this extensive explanation on Dorje Shudgen Oracles, Oracles and trances as well as the detailing of the Oracle Statue commissioned at KFR. and guide us along the Dharmic Path. Through Rinpoche’s kindness and this Statue, may we continue to be blessed with many more close encounters with Dorje Shudgen in the future, and I hope to be able to visit this statue and make offerings some day soon. The beautiful oracle statue is having so much meaning as we can read in the article. Trances is something I was not familiar with and I never witnessed a trance before 2015, when H.E. the 7th Panglung Kuten, also known as Choje-la took trance in Wisdom Hall. I remember that Rinpoche himself started to become an oracle when he was younger. The tradition of oracles is very helpful and beneficial to many. I rejoice that this tradition is well preserved in Kechara Forest Retreat, along with this statue, the Panglung Ritroe, the official place of residence to the oracle of Dorje Shugden, His Eminence the 7th Panglung Kuten, is here in Kechara Forest Retreat. Thank you for this indepth article and the stunning pictures. Thank you Rinpoche for sharing this article. After reading this article, I learn a bit more about the different types of oracles and that there were oracles too on the earlier days and in different religions. For me, because my family is Taoist, my grandma used to go to the Kuan Yin temple to seek solutions and treatments from the medium who was in trance of Kuan Yin. I was impressed and excited when I attended Oracle Trance that was held in Wisdom Hall 2 years back. It was totally an eye opener and new experience altogether. The Dorje Shudgen oracle statue in Wisdom Hall’s Audience Room is amazing. Look at how much work and effort that have been put in to create this statue. It takes a lot of merit to be able to create this statue and also collects a lot of merit too. Rejoice to everyone who were involved in creating this statue. At my very young age, i am fascinated on Taoism Oracles, how Gods or even spirits can communicate thru human bodies, and why “They” wanted to do this? I like the statue and felt it is filled with energy. Almost like real life like. I saw the photos on how it was done and the progress shown. I thought to myself how beautiful and crafty this can be and so much energy being put into making this. While looking at the photos, one could imagine why this statue actually have significant meaning to our beautiful Kechara Forest Retreat. This has got to do with creating the affinity or cause for our very own oracle in future. This is a very precious practice to be brought down generations after generations and am glad this is being practised till these days. It will certainly be wonderful to have our very own oracle. I heard from previous times that the crown that the Lord Setrap oracle wears are at least 80kg heavy and heavy enough to break ones neck and this is no joke. Someone who is untrained to be an Oracle will surely have his neck broken. Thank you Rinpoche for the detailed article. The photos were priceless. Wow …incredible and informative article .I am glad able to know more and understand better of the unique Dorje Shugden Oracle.But have not seen one yet and hope i could in future.Rejoice to those who witnessed the oracle in Kechara Forest Retreat. Good research done and very comprehensive article covered widely. And do hope more people world wide will get to know, understood all about Dorje Shugden oracle.Formost there’s a unique Dorje Shugden Statue at Kechara Forest Retreat in Bentong,Pahang, malaysia. 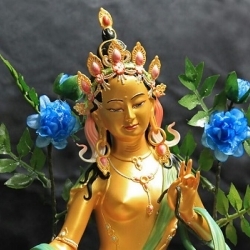 The Dorje Shugden Statue is indeed very beautiful and stunning. The practitioners rely on Dorje Shugden to give clear advice, bestow blessings, and perform miraculous works. Thank you Rinpoche for sharing these incredible and informative article. I really like the oracle statue. When I saw it in Wisdom Hall, I was just staring at it in awe. He look so real and He was done really well. The vibrant colours just made me stare at almost every part of it. And the beautiful offerings. From the photos, one can tell how much hard work and how meticulous the work was done. Its amazing to have this oracle statue to create the affinity and also create the cause to have our very own oracle in Kechara. From what I have read, its not easy for one to train as an oracle. Lots of hard work, retreats and most important, pure Guru devotion. How meritorious and beneficial for many people. “We are lucky these ancient and sacred traditions have been preserved and handed down by our lineage lamas so we can benefit from their existence.” Yes, how lucky and blessed we are to have this from our Guru. 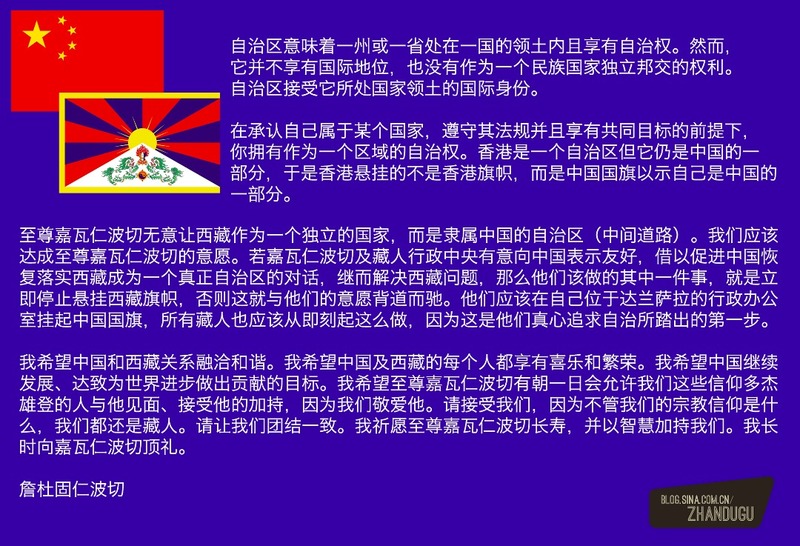 One question though, why does the Tibetan government use non Enlightened beings to consult on matters of state? Quite confusing as I thought that they are not Enlightened and therefore they may not have powerful clairvoyance as the Enlightened beings have. Thank you Rinpoche and team for this beautiful oracle statue! This article really provide an extensive information about oracle. Consulting an oracle or medium is not something new instead had a long history and culture from many different spiritual believes from all over the world. As it has been mentioned in the article, due to the karma many of us we can’t see or talk to the higher being so they take procession through the oracle to bless us, advice us for our spiritual and non-spiritual matter. I don’t see this as right or wrong but it’s just a need for people to gain hope in their life and eventually for their spiritual path/journey. Personally I see an oracle as an compassionate being that willing to take up the time and effort to be trained and to benefit many people. It’s not easy but through their determination to help others the lama and the oracle work very hard to benefit many sentient beings. Thank you Rinpoche for creating the oracle statue for us to create the the cause through making offering for us to be able to connect to the protector in this case is Dorje Shugden and able to listen to his advice in future. To know is to have faith. This article is comprehensive with loads of information about oracles especially the oracles of Dorje Shugden. Even if we do not believe do not detract from the fact that oracles exists and that they have helped many people. It’s like if we don’t hear the noise made by a tree falling in Siberia does not mean that trees do not fall in Siberia. This statue od the oracle is beautiful and evocative of faith. From the stance to the facial expression to the oracle costume, it looks so much like the photo of the oracle in trance. Thank you for sharing these images of the oracles and the oracle statue. Thank you Rinpoche for commissioning to create Dorje Shugden Oracle statue for us to stay closer to Dorje Shugden and most importantly, to create the causes for us to communicate with Dorje Shugden in future. The trance of Dorje Shugden in Oracle form is vital for our spiritual growth through the blessings, advice and Dharma teachings receive directly from Dorje Shugden. 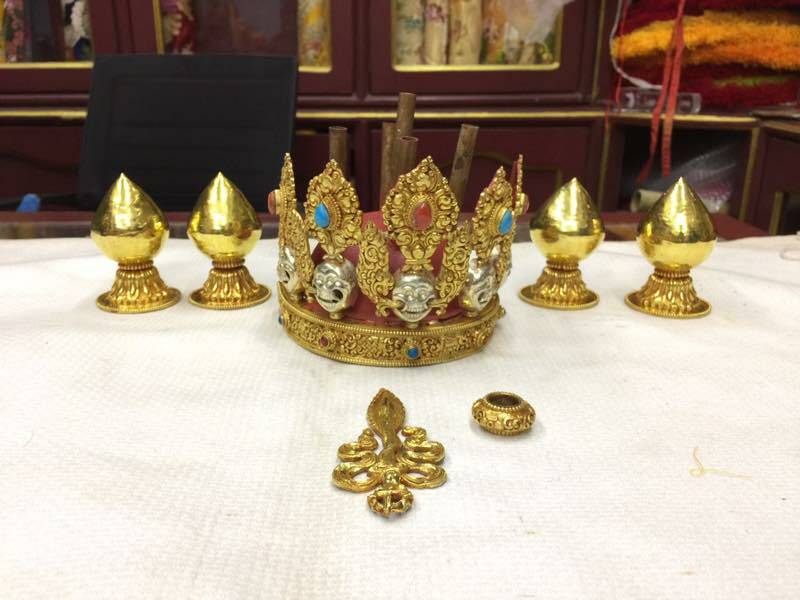 Based on my understanding from this article, it is very important for us to create and pray to Dorje Shugden Oracle statue with utmost respect so that our connection with Dorje Shugden will become stronger and closer rather than dying out due to our degenerating age. 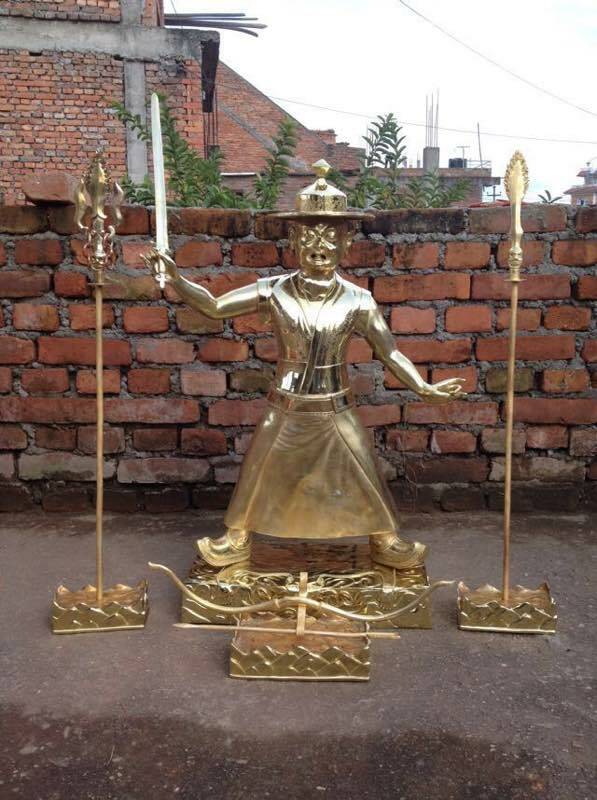 The amount of time, energies, effort and resources utilized to create the Dorje Shugden oracle statue is enormous. Besides, it is our blessings if we have the opportunities to serve or assist the Oracles of Dorje Shugden as these Oracles have gone through many levels of training and practice before they can take the trance of Dorje Shugden and other enlightened Dharma Protectors. We are truly fortunate and blessed to be part of the 700 people who have attended the trance taking of Dorje Shugden and Kache Marpo by the 7th Panglung Kuten in Kechara Forest Retreat on 21st June 2015. I wish and pray that more and more people able to receive the blessings and Dharma teachings directly from Dorje Shugden through the Oracles in future as Dorje Shugden is the emanation of Buddha Manjushri, who can guide us towards achieving liberation from samsara, attainment and ultimately Enlightenment. Dear Rinpoche, thank you for sharing and enlightening us on the oracles in Tibetan tradition. Seeing Dorje Shugden in trance is indeed a great blessings for us all. The oracle statue is extremely well made and does evoke faith. Is there a strong or uncommon relations between DS and long life Tsongkhapa? Anyway just asking. I wish you long life and great vigour. It is indeed fortuitous for these to manifest in Malaysia. Have a nice day !